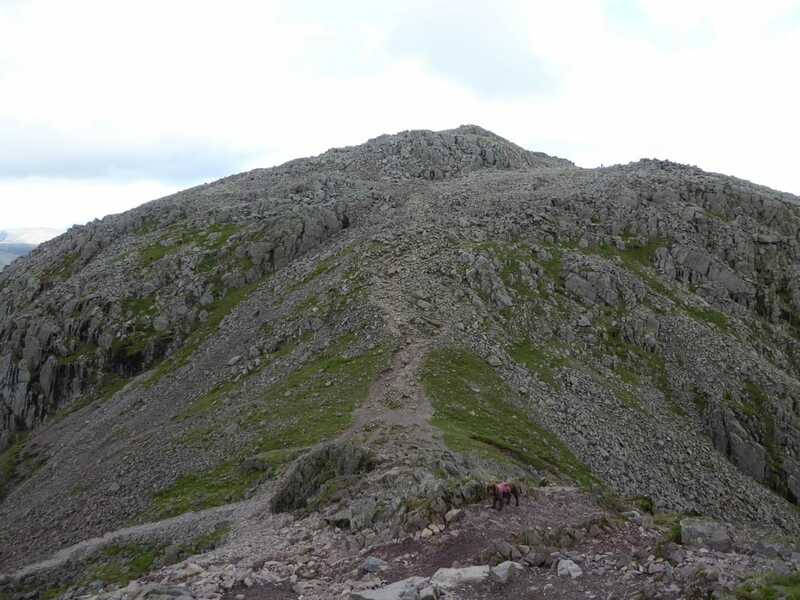 Well used and clear mountain paths for the most part - a description of the route up via Piers Gill can be found in Wainwright's Book 4 (The Southern Fells) on page Scafell Pike 14 . 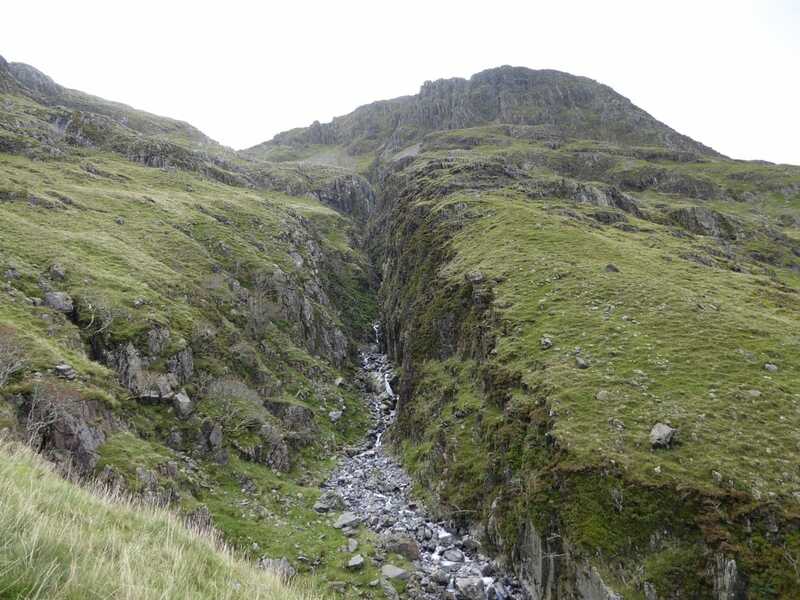 The path up the side of Piers Gill is intermittent and there is some easy scrambling to negotiate. 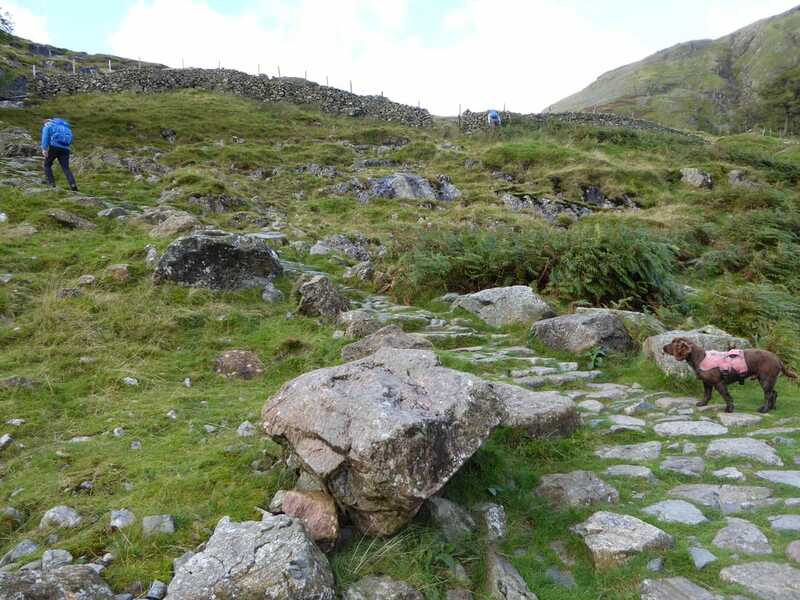 The descent into Broad Crag Col is steep and stony - care should be taken. 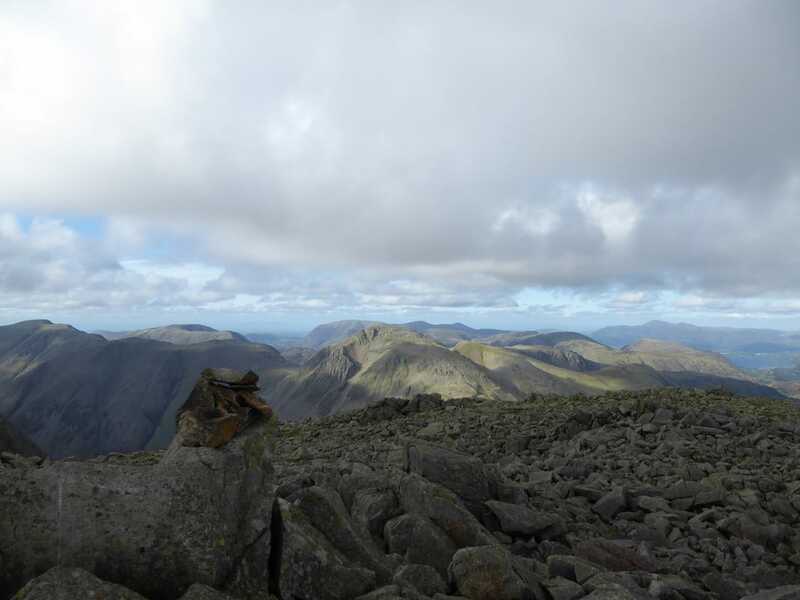 Overcast, sunny spells and light breezes with very good visibility. 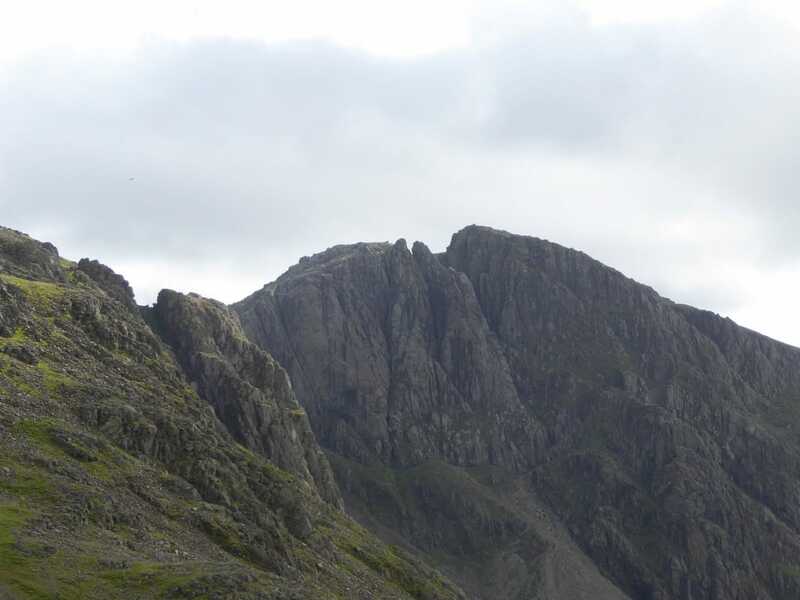 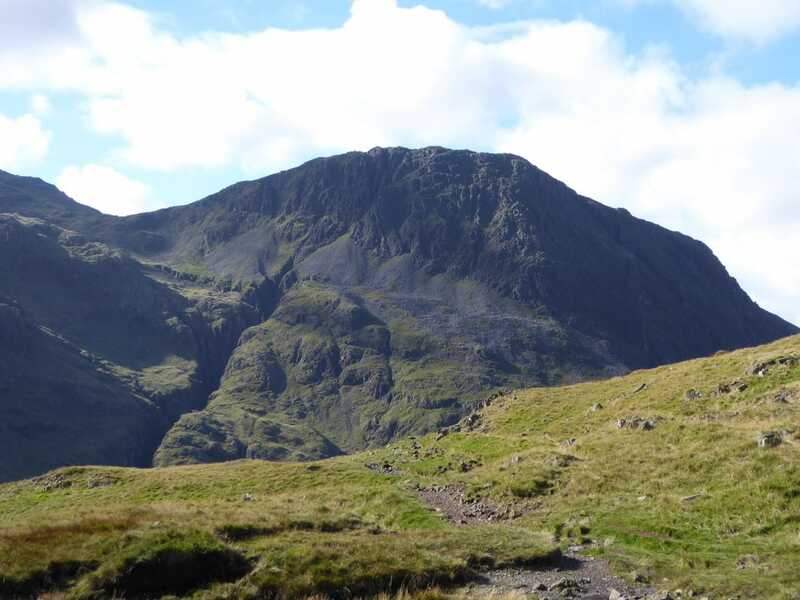 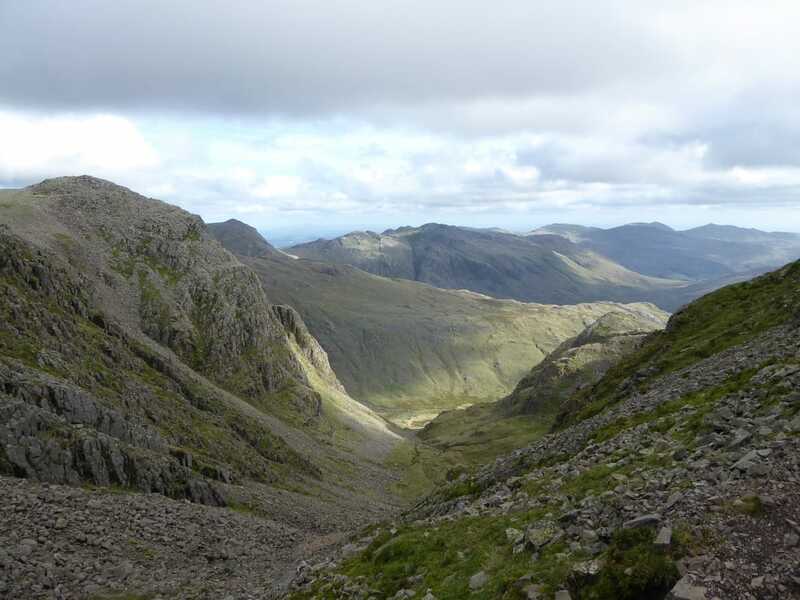 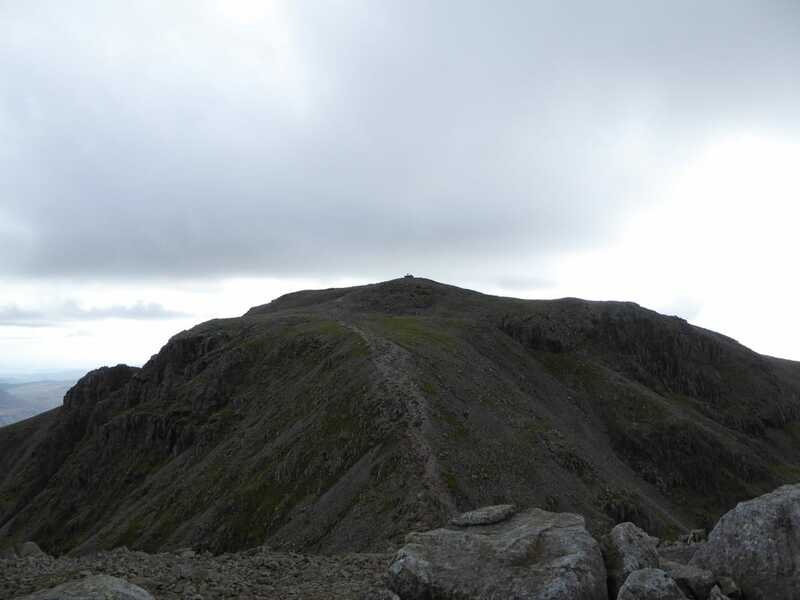 People have often said to us that one of the best ways up Scafell Pike is the route via Piers Gill. 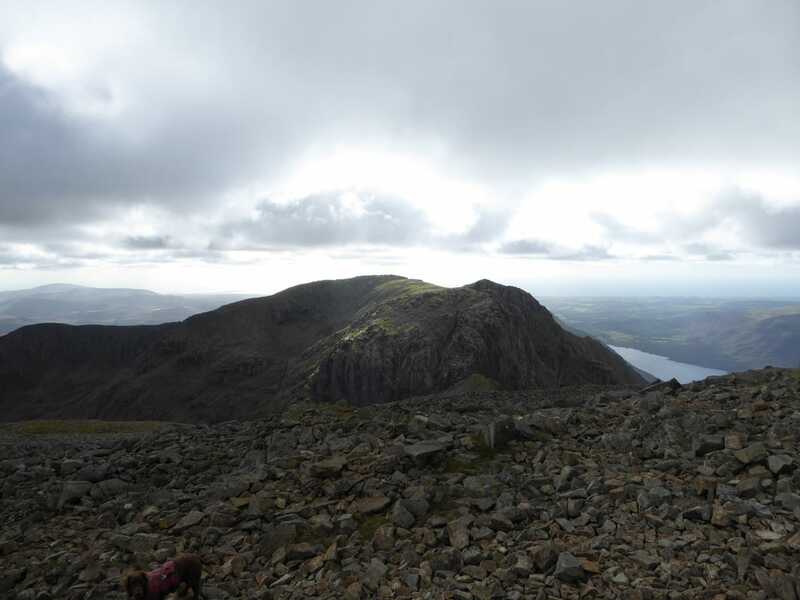 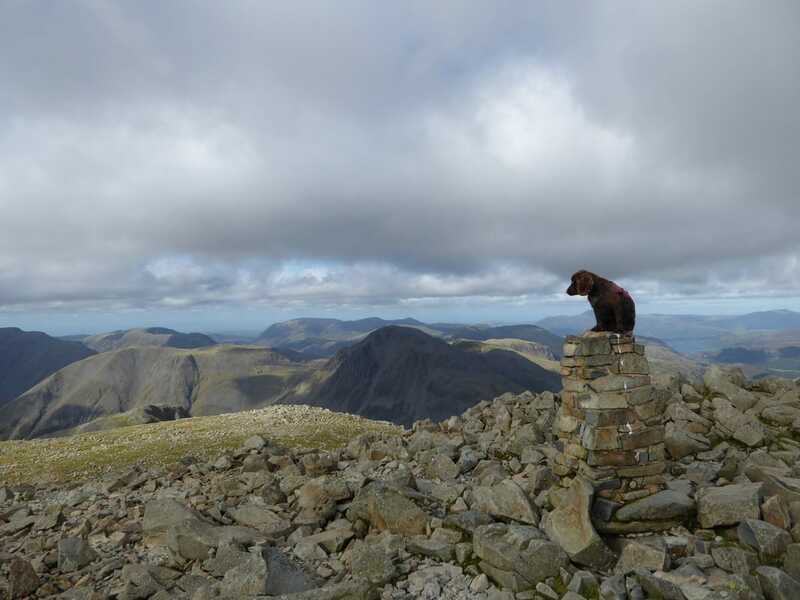 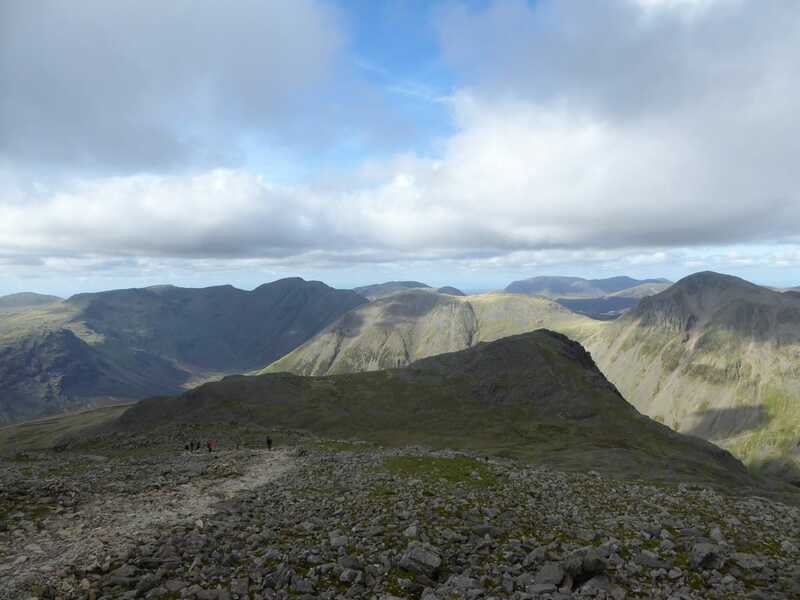 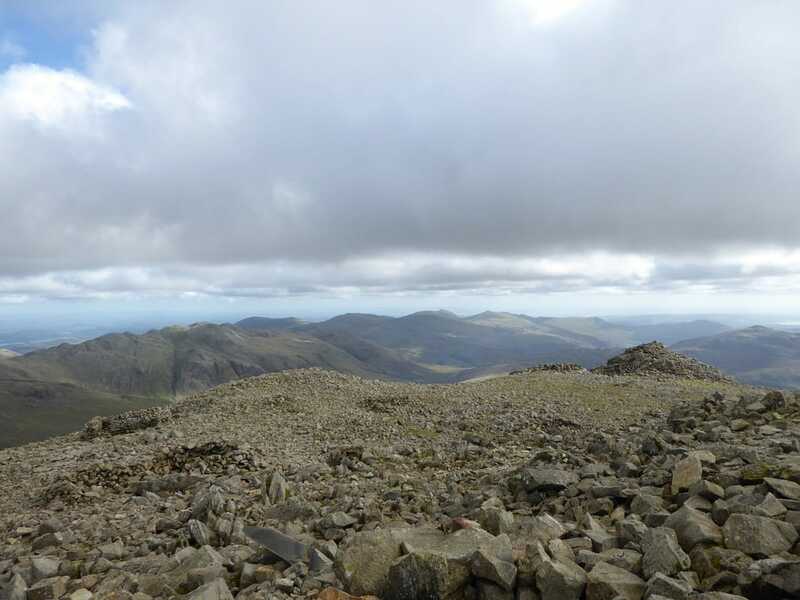 Whilst not anti social, we do not like crowds that much therefore any ascent of Scafell Pike in the past has been on the less popular routes, late in the day and then on days when there are not too many people about. 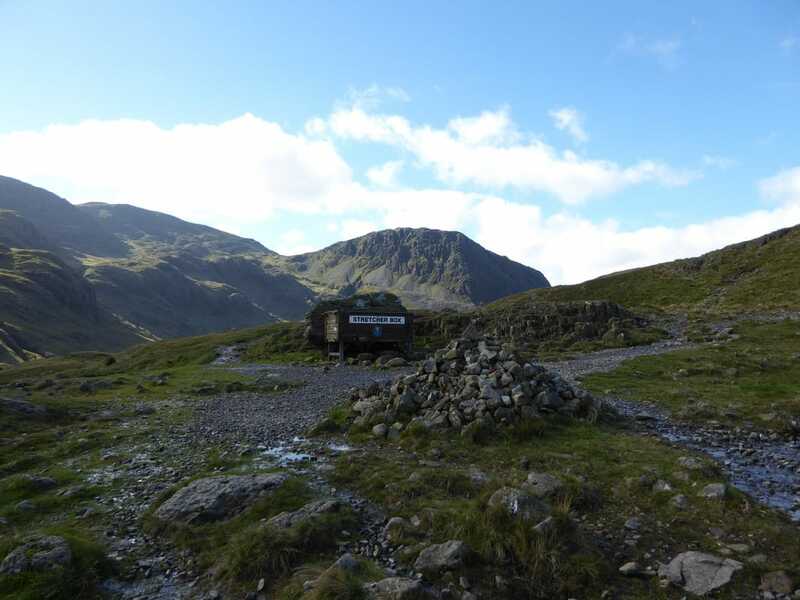 Therefore the intention today was to walk to Sty Head, pick up the Piers Gill path, bag a couple of Nuttalls and then head to Lingmell. 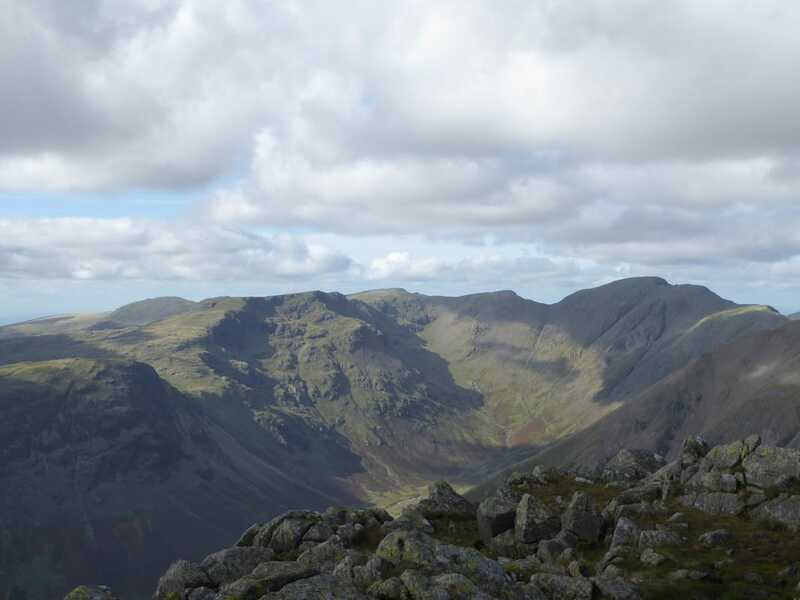 From Lingmell we then intended to join the Hollow Stones path coming up from Wasdale and visit Scafell Pike before returning to Seathwaite via Broad Crag, Ill Crag and Esk Hause - that was the plan anyway. 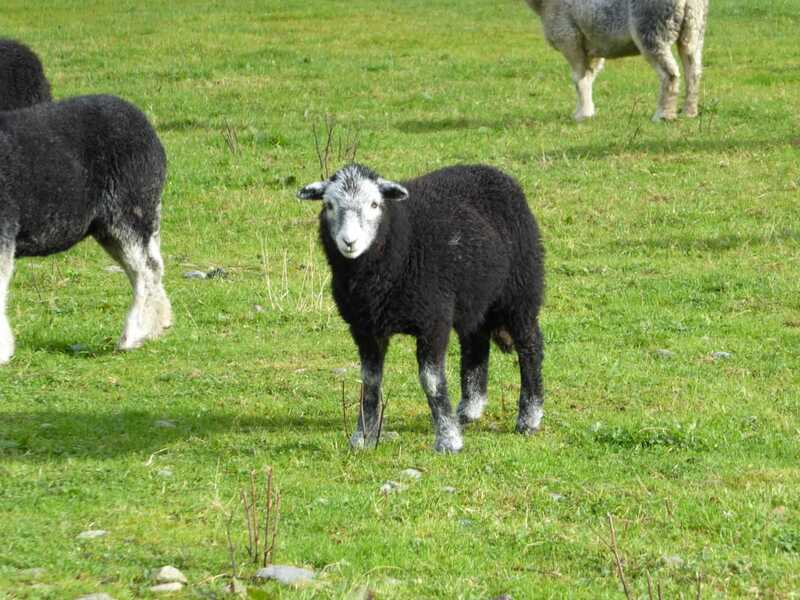 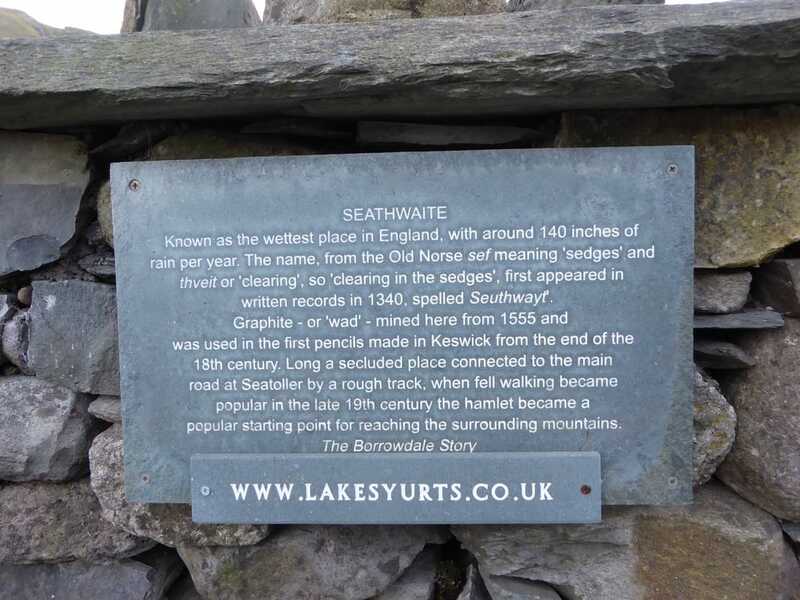 The route today could be started from either Seathwaite Farm or Wasdale - we chose Seathwaite as we were staying in the Northern Lakes. 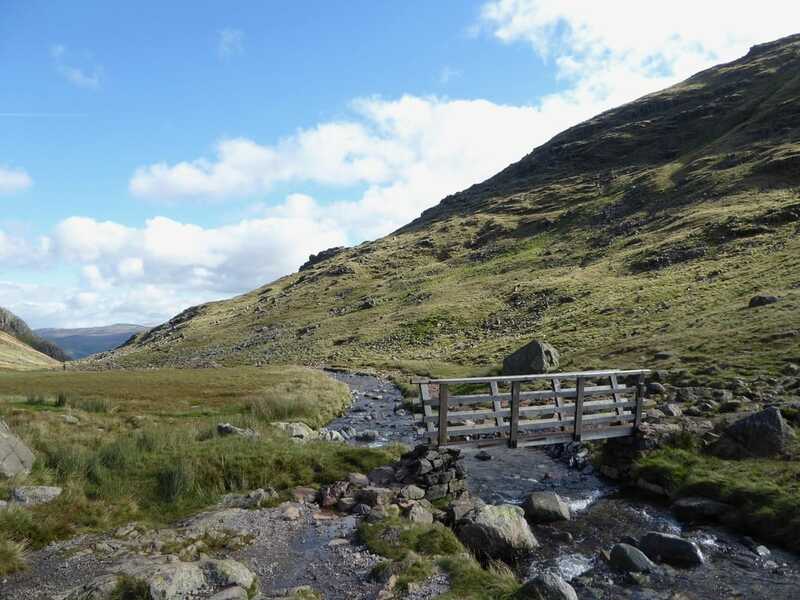 Leaving the farm we headed up to Stockley Bridge and from there steeply up to Greenhow Knott from where the gradient eases. 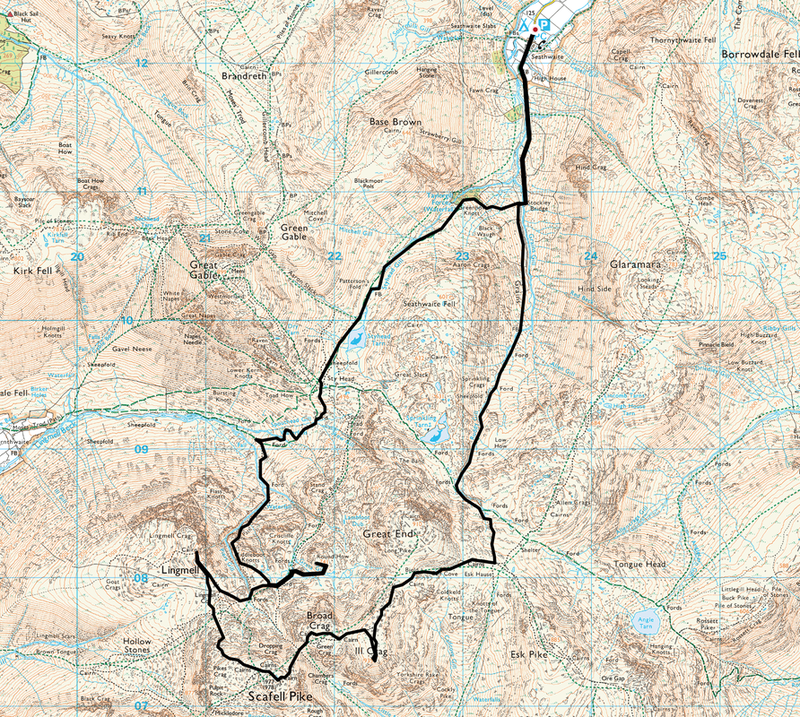 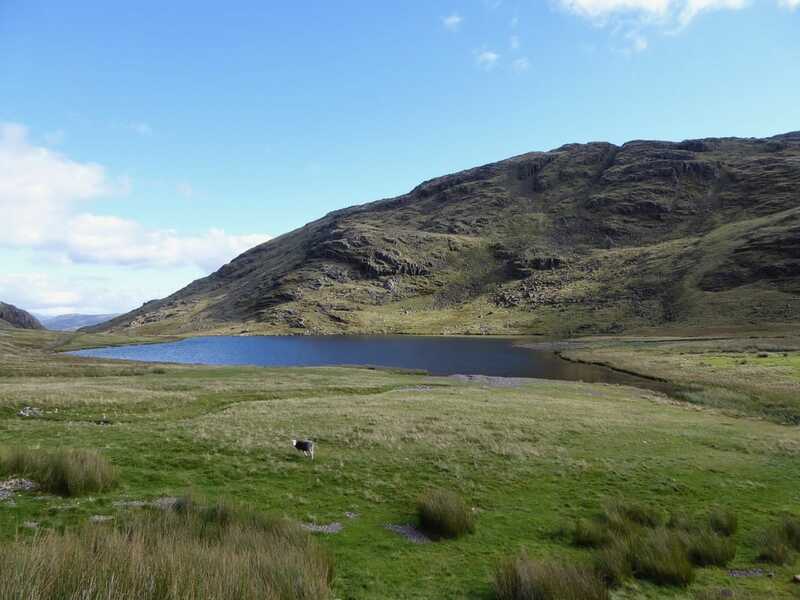 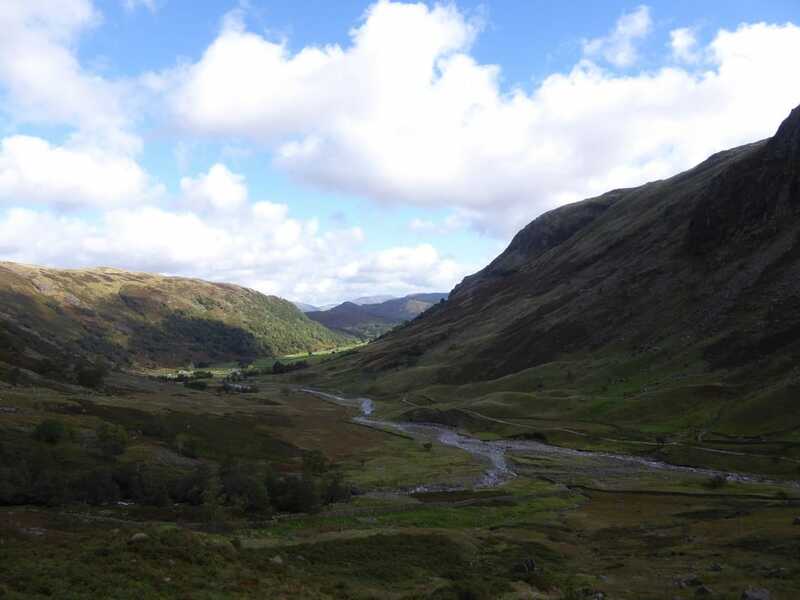 The route then handrails Styhead Beck, passes Styhead Tarn to then arrive at the Mountain Rescue Post at Sty Head. 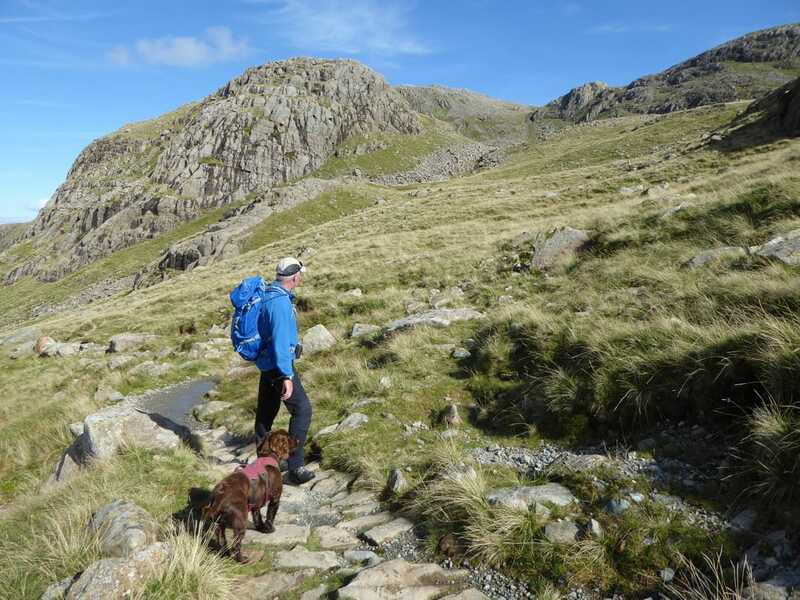 From Sty Head there are a myriad of paths leading all over the place therefore it is important to get your Nav sorted before moving off. 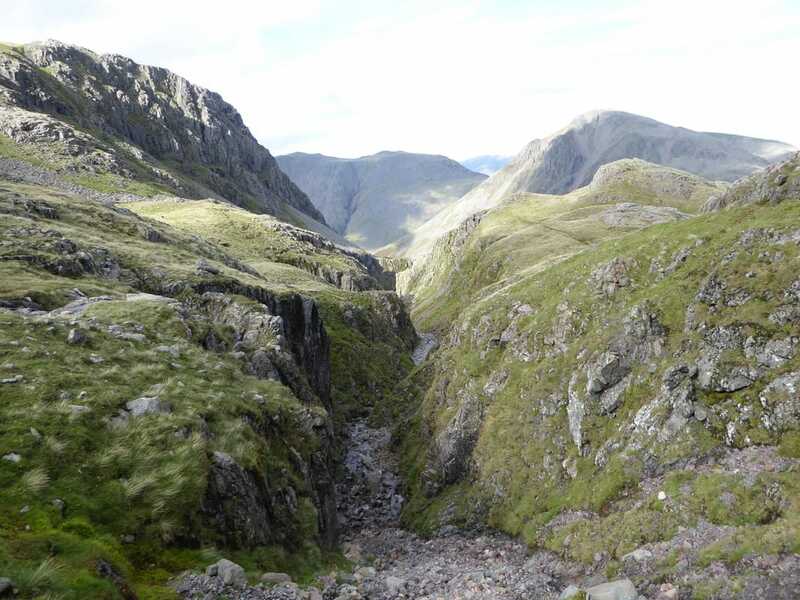 The path leaves Sty Head to move more or less parallel with Spouthead Gill, losing height as it heads in the direction of Wasdale Head. 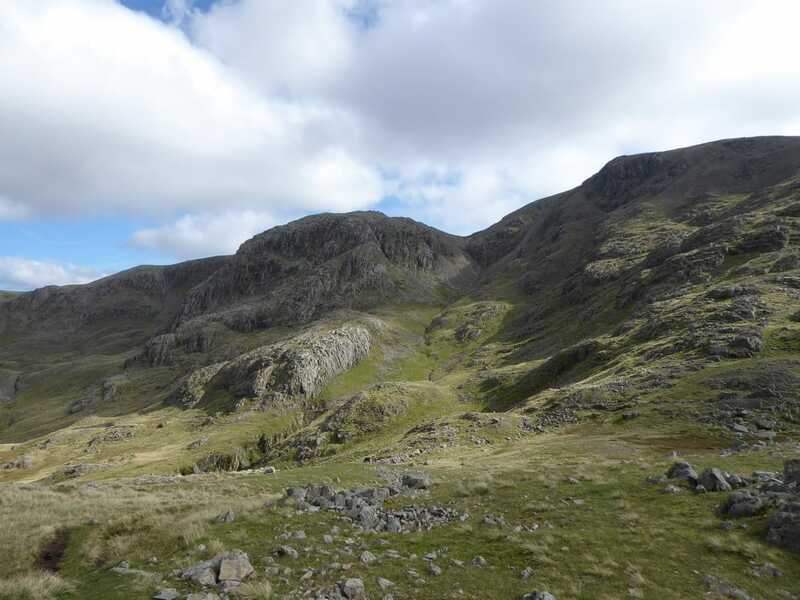 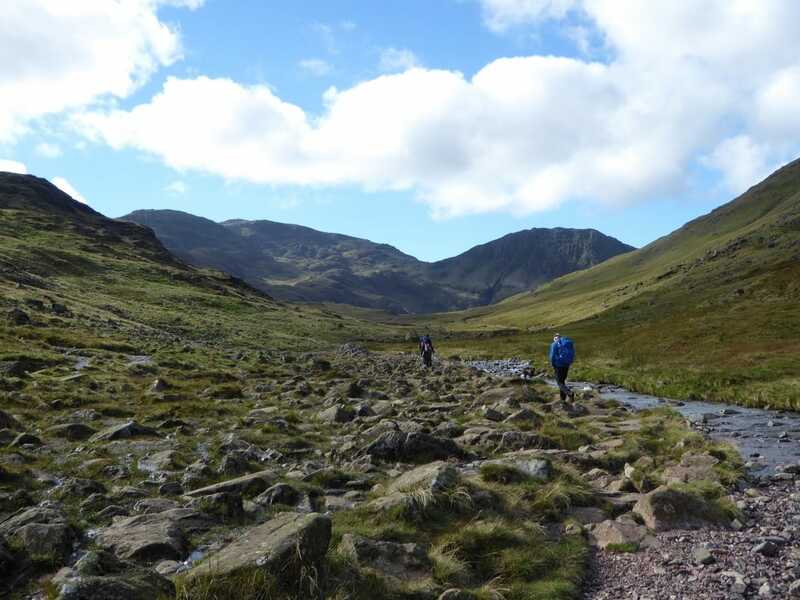 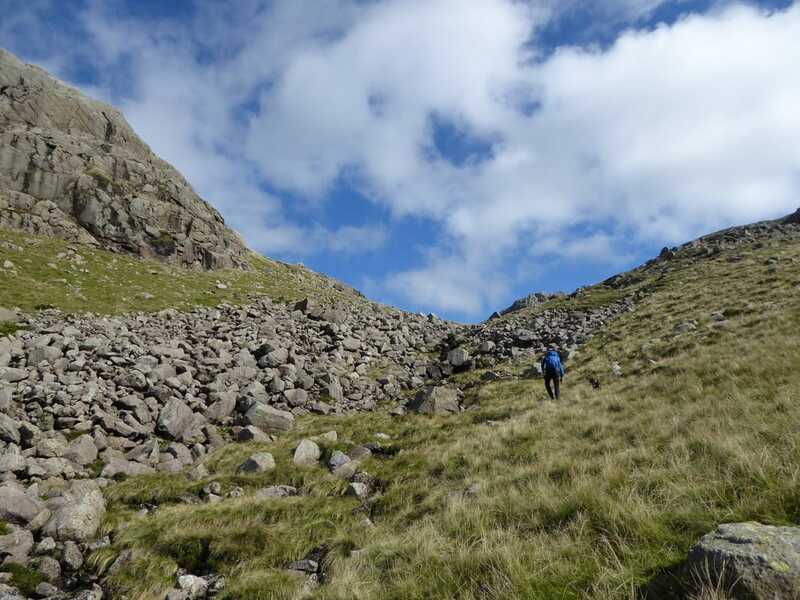 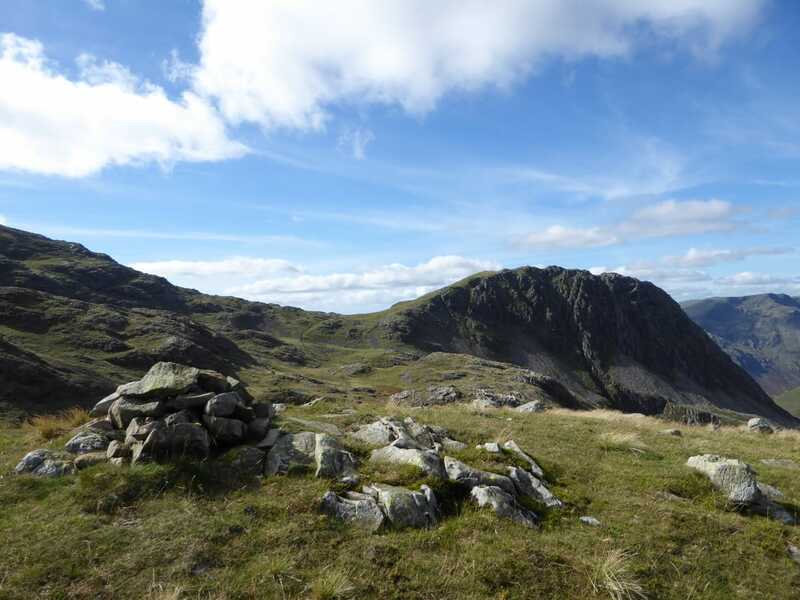 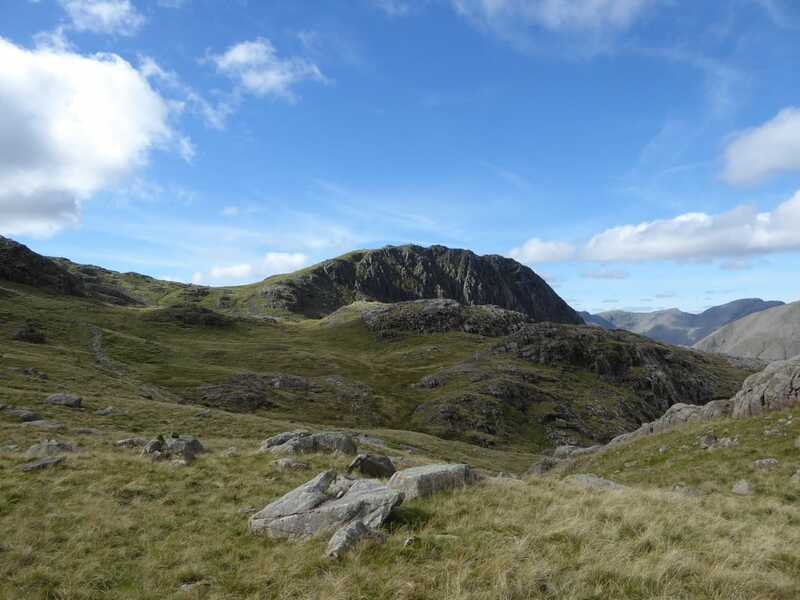 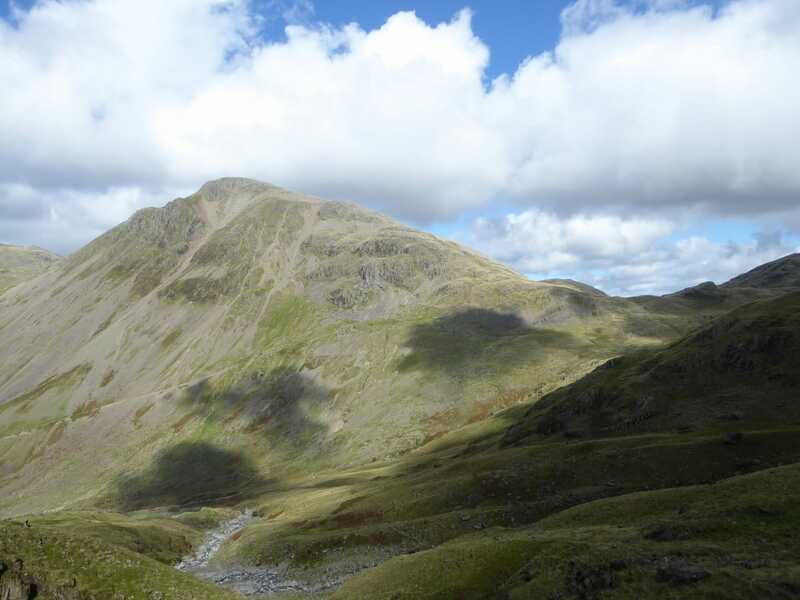 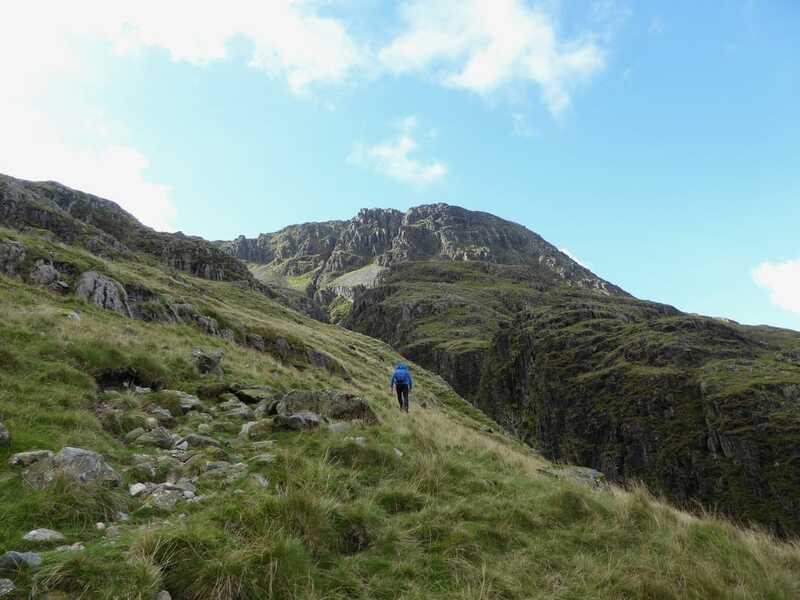 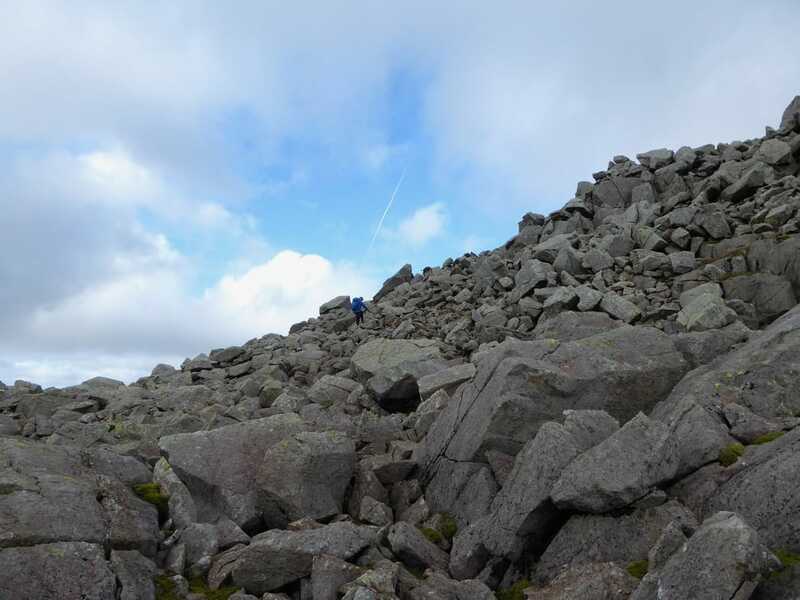 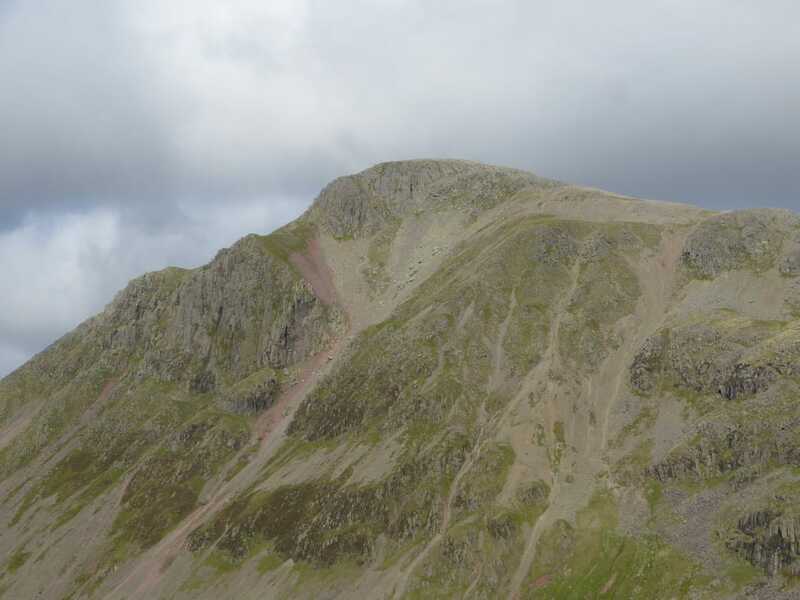 At a large boulder, the route changes direction to the south and heads uphill once more on a faint path to reach the lower reaches of Piers Gill. 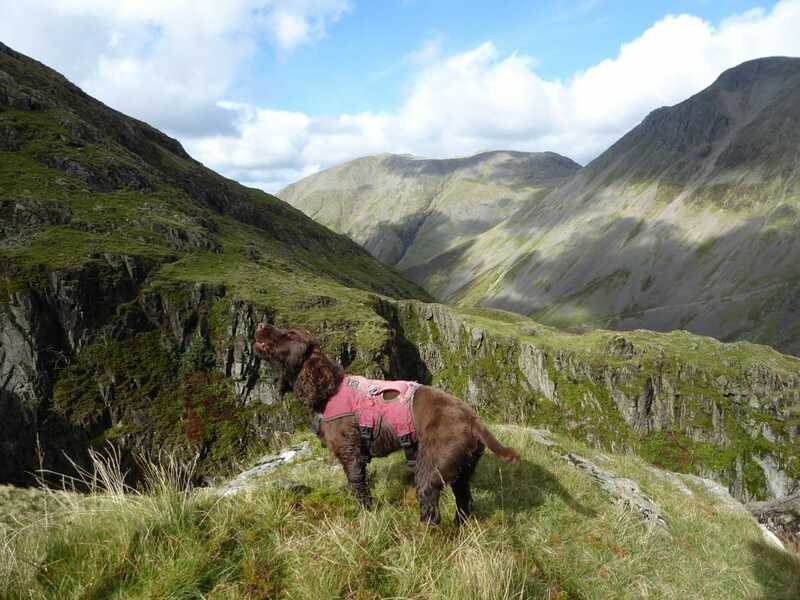 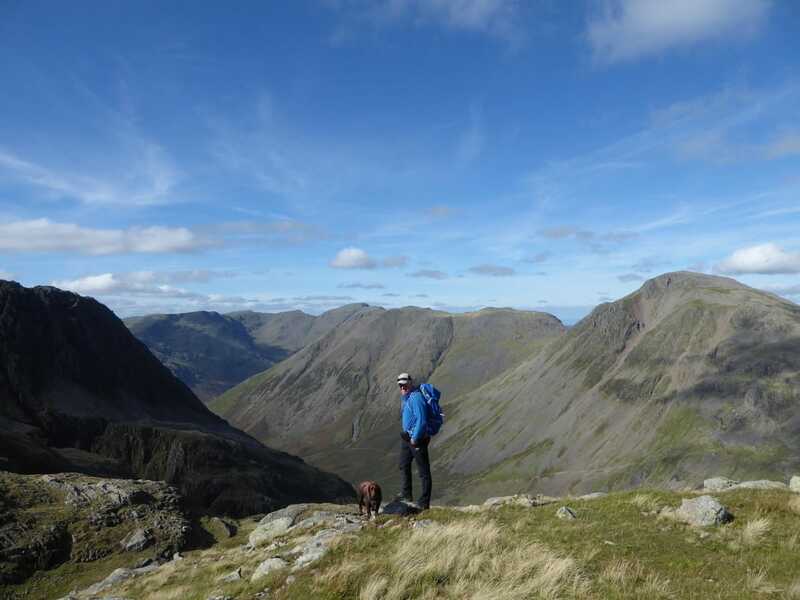 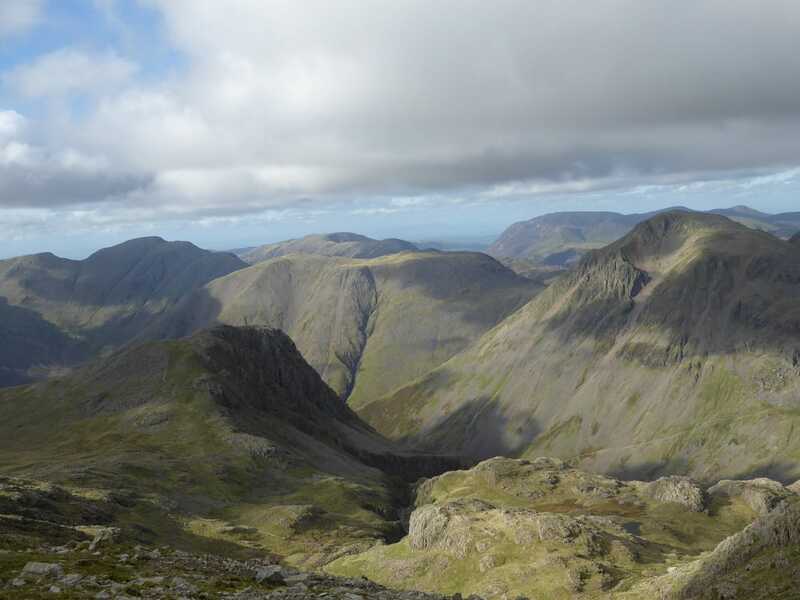 There are fantastic views right down into Wasdale and over to Great Gable. 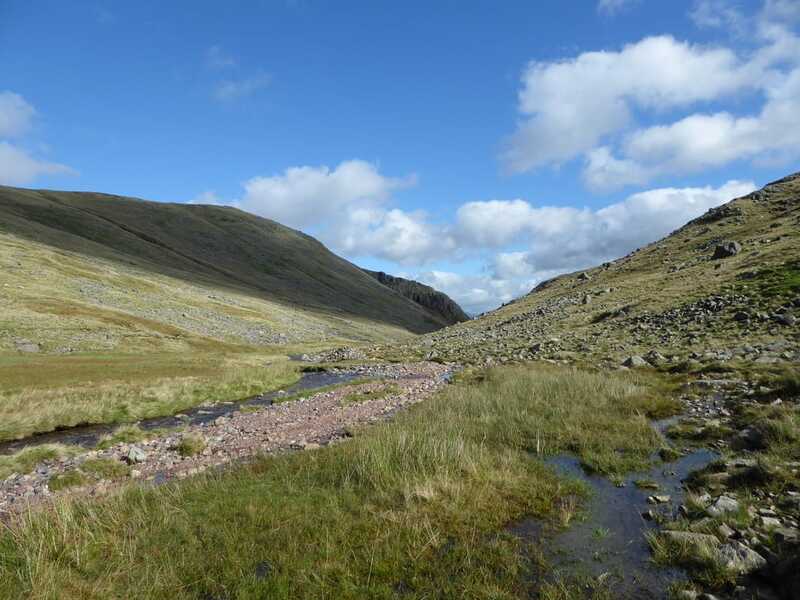 Heading away from the gill for a short time, the path then fords Greta Gill before once more heading up the left hand side of Piers Gill. 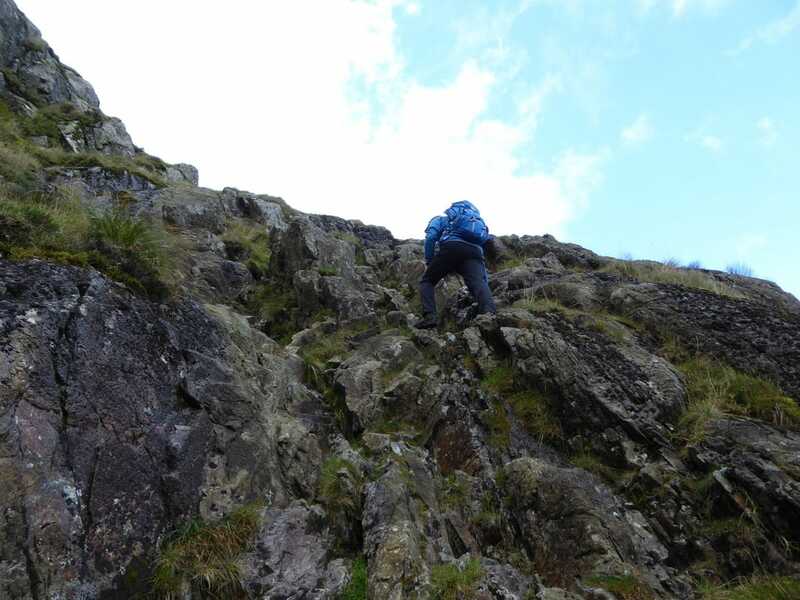 The climb up the side of the impressive ravine is exhilarating and opportunity should be taken to enjoy the striking scene into the depths below. 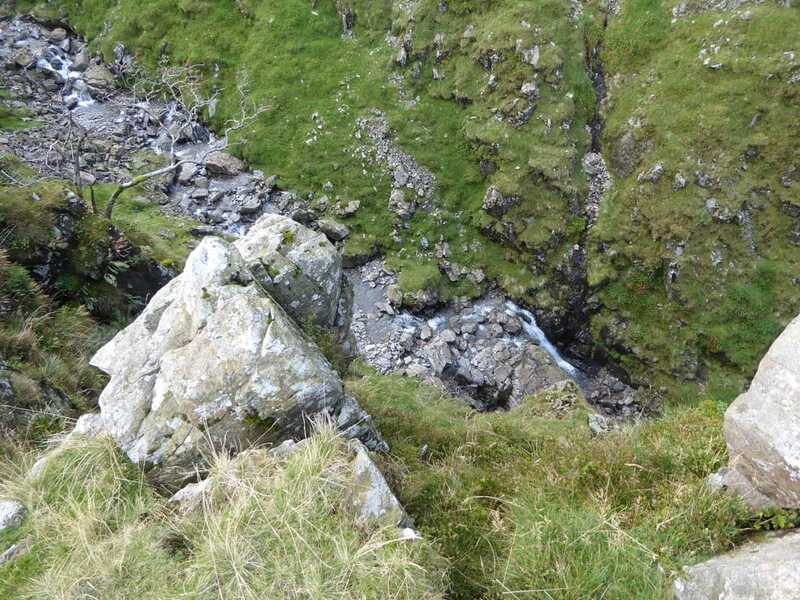 However, extreme caution should be exercised as there is loose rock and erosion on the edges of the Gill. 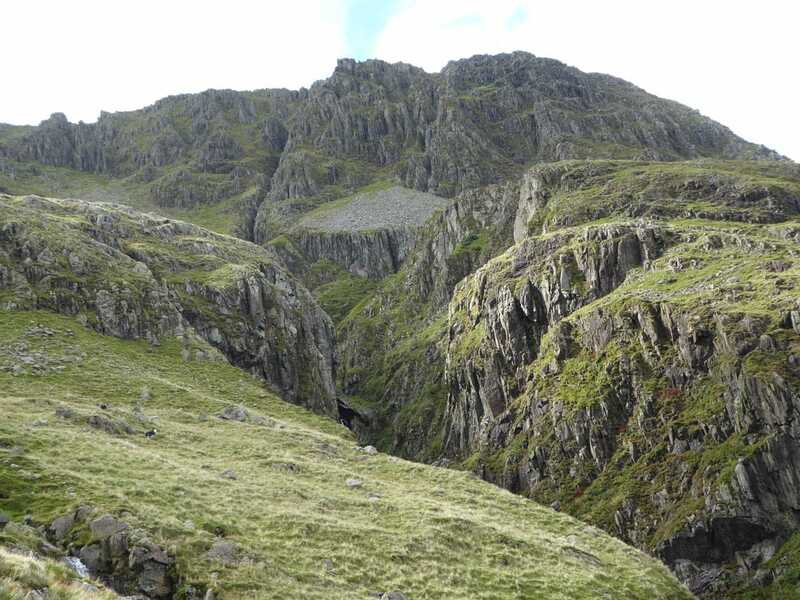 Shortly before Piers Gill turns sharply left there is a scramble to be negotiated over a steep wall of broken crag but this is not overly difficult. 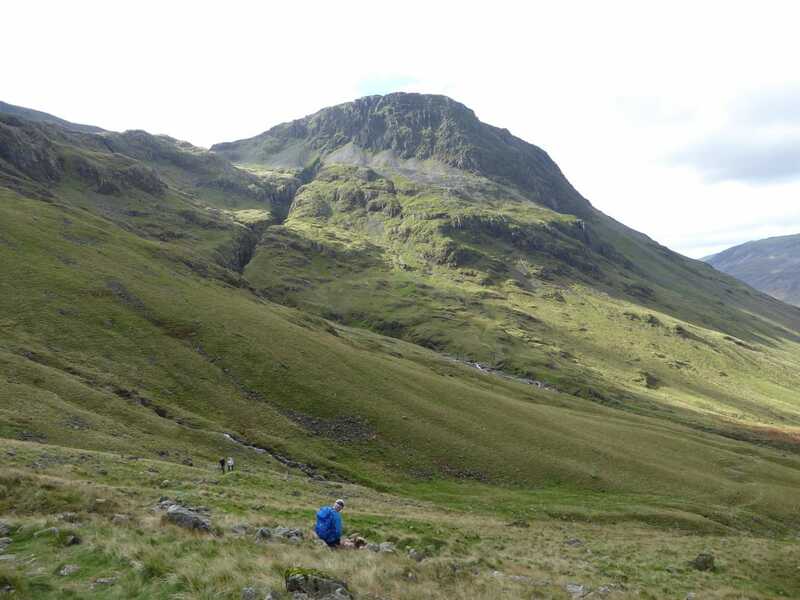 The remainder of the ascent was along the grassy path and shortly before reaching the head of the gill we left the path to make the short ascent up to the Nuttall of Middleboot Knotts. 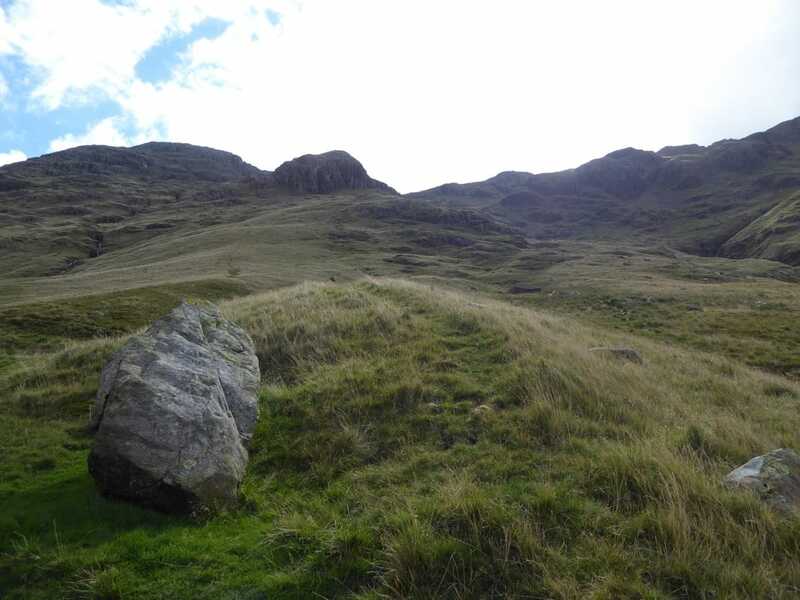 From the summit of Middleboot Knotts we headed south east to join the Corridor Route coming up from Sty Head but left this on a vague path to eventually handrail the stony bed of Greta Gill. 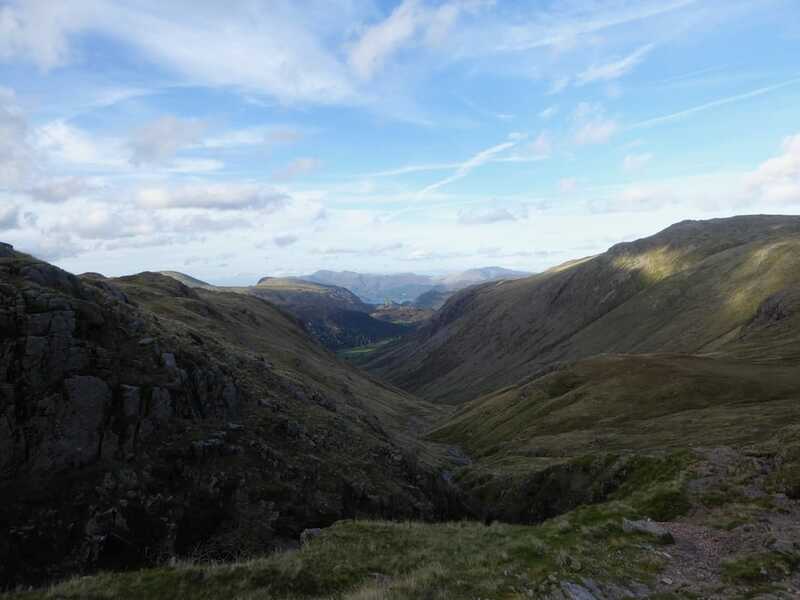 The path up via the gill is easy to see in good visibility but could be missed when the clag is down. 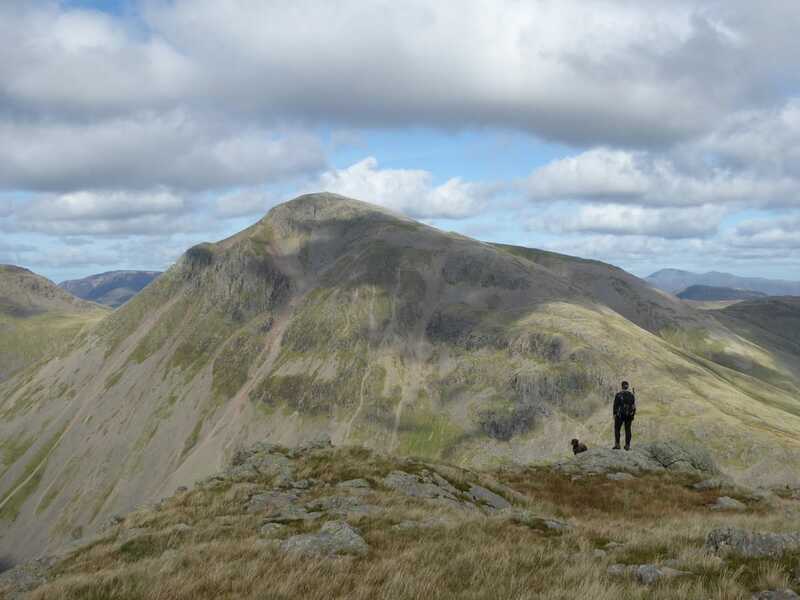 After crossing the gill, it was an easy ascent to attain the summit of Round How and again the views were spectacular. 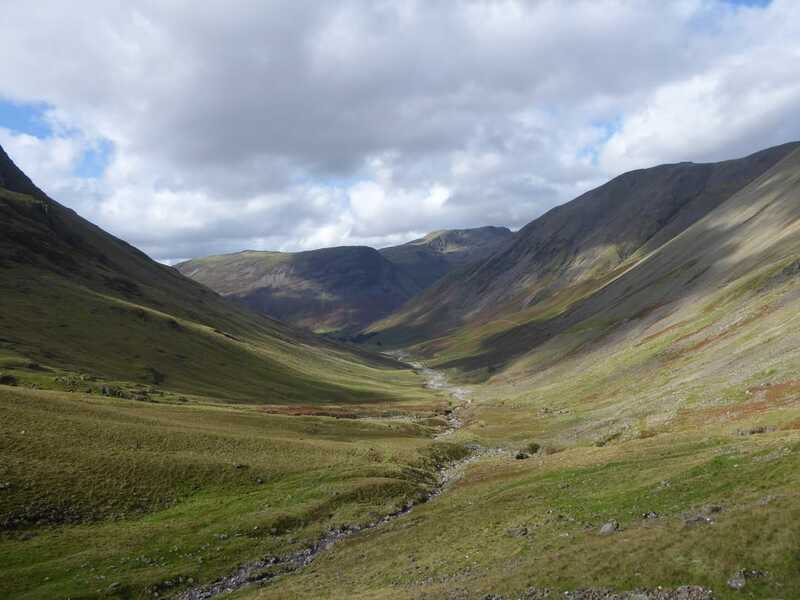 Returning the same way, we headed along the Corridor Route to reach the head of Piers Gill where there is a great view down into the ravine. 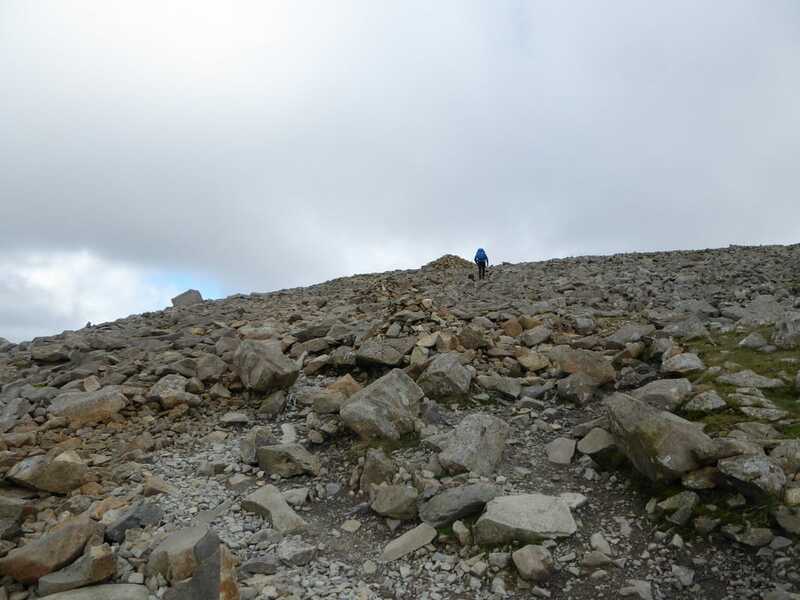 The route then heads uphill once more to reach a broken wall which we followed to the grassy area of Lingmell Col although there is a clearer path a bit further south which also reaches the col but a little further to the west. 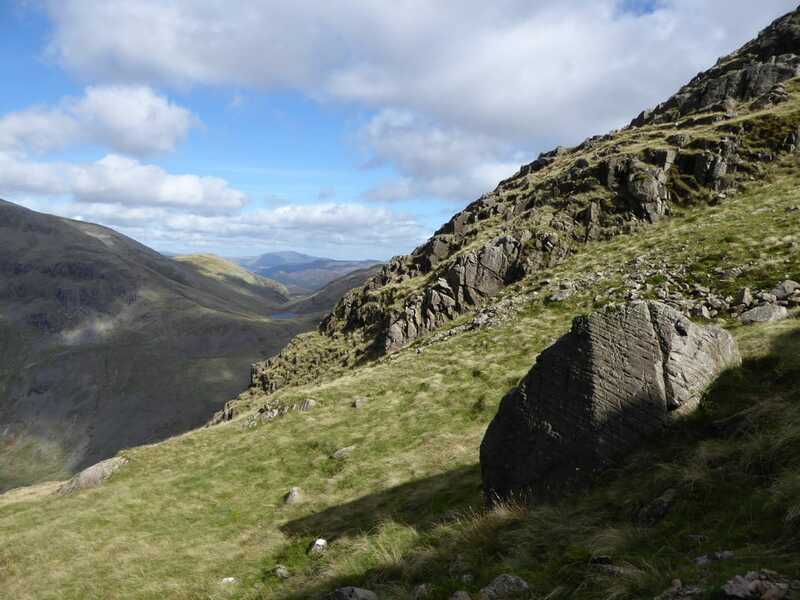 From Lingmell Col we watched the many people descending into Wasdale from Scafell Pike via the Hollow Stones path - by this time it was about 1530 and there were not that many people coming up the other way. 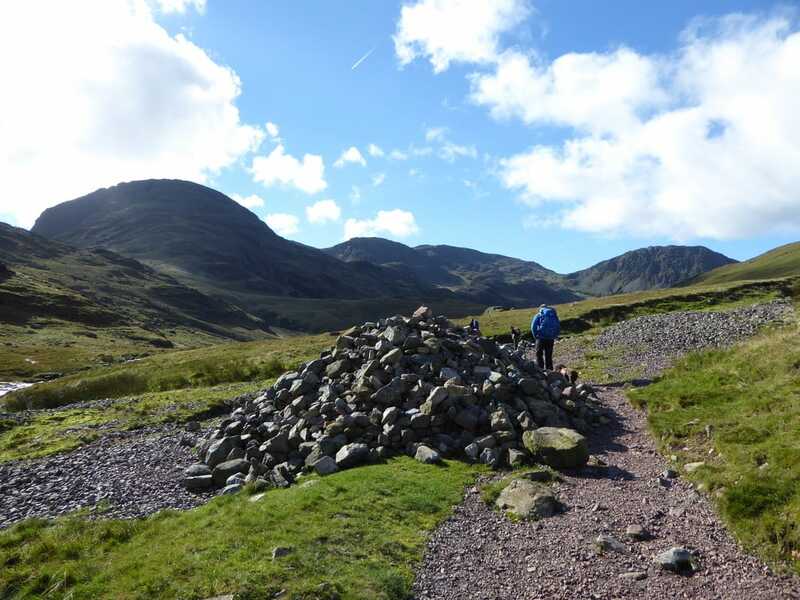 The ascent up to Lingmell is gradual and soon the large and impressive cairn on the summit is reached and with it a superb panorama down over Wasdale, Wastwater and over Mosedale to Yewbarrow and Pillar. 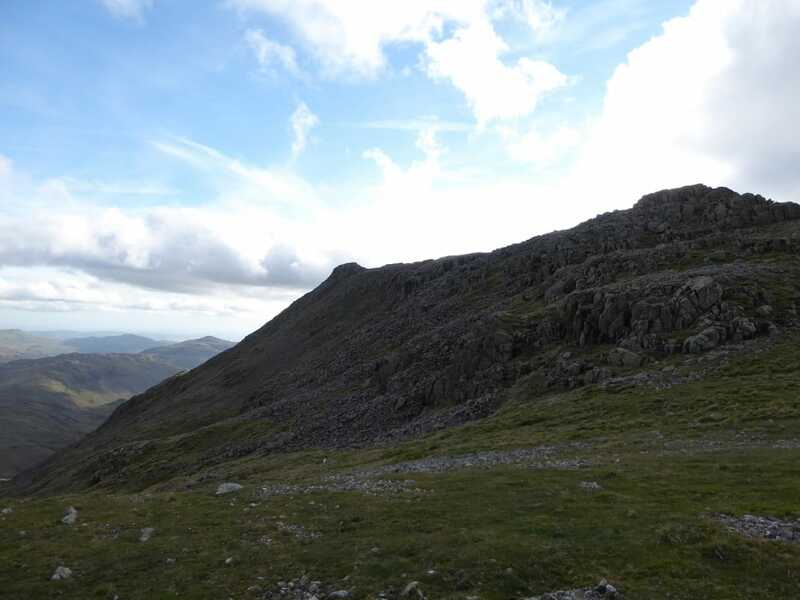 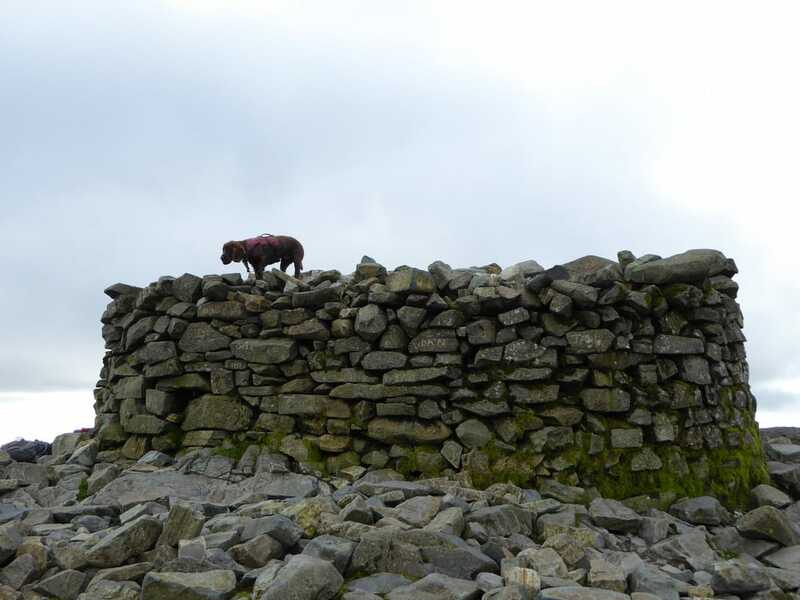 Returning to Lingmell Col, there was now a bouldery and steep descent up the popular path to Scafell Pike and with only a handful of people making the ascent we knew that we would see it fairly quiet on the summit - and so it proved. 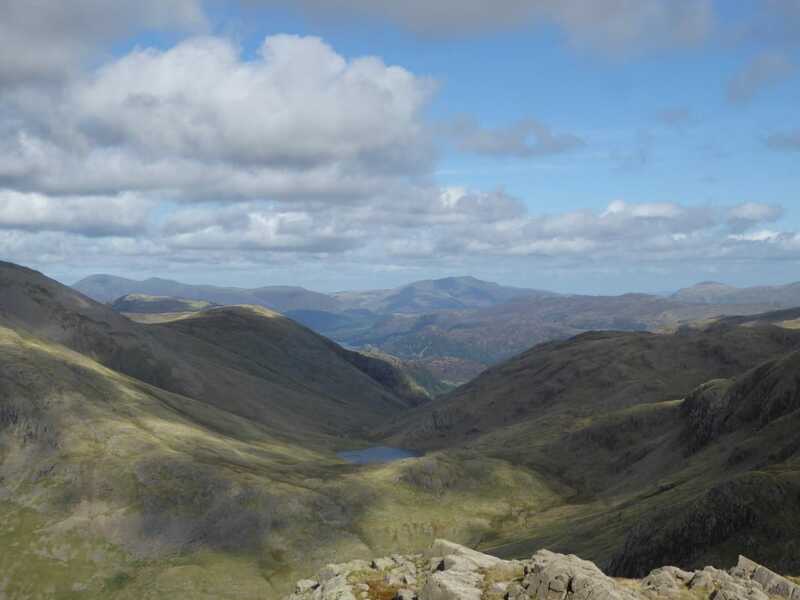 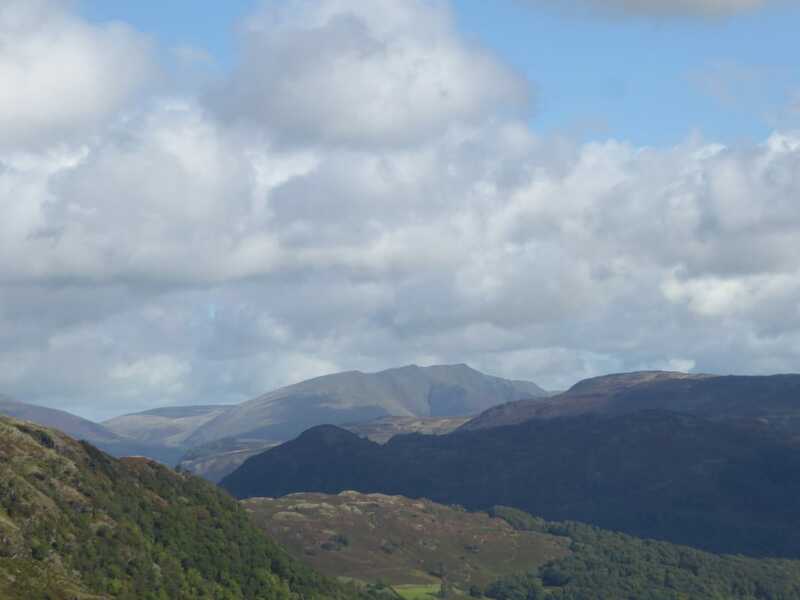 As you would expect, there is a fabulous Lakeland panorama from the Roof of England and we hung around a while here just taking in the spectacular view on offer. 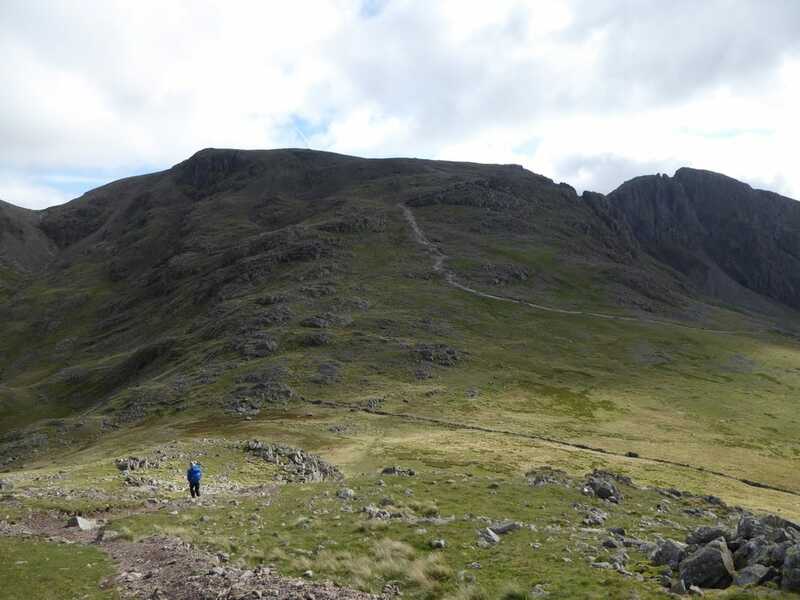 Scafell Pike can be a confusing place even in good visibility and it is worth just making sure you are heading in the right direction before you make your exit off the mountain. 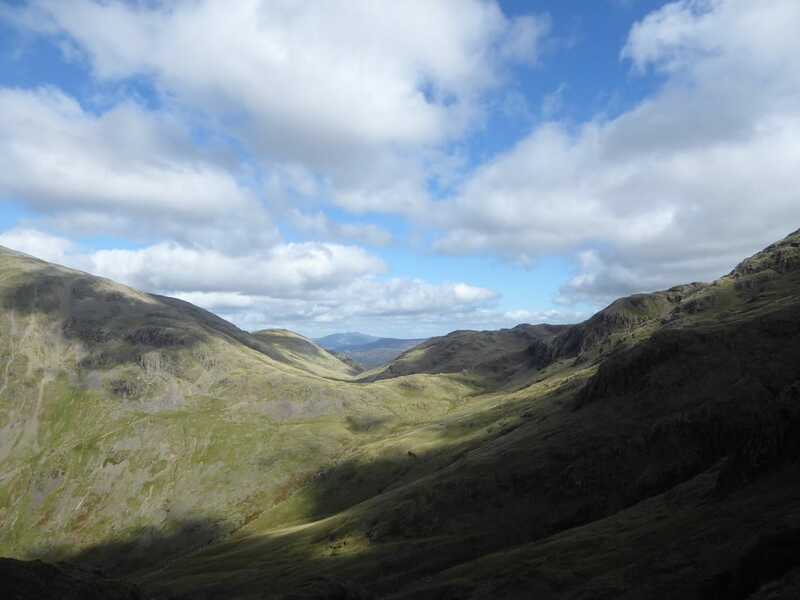 We were heading north east to make the steep descent into Broad Crag Col - on reaching the col there is a fabulous view to the right down Little Narrowcove - a long, steep & stony hollow which comes up from Eskdale. 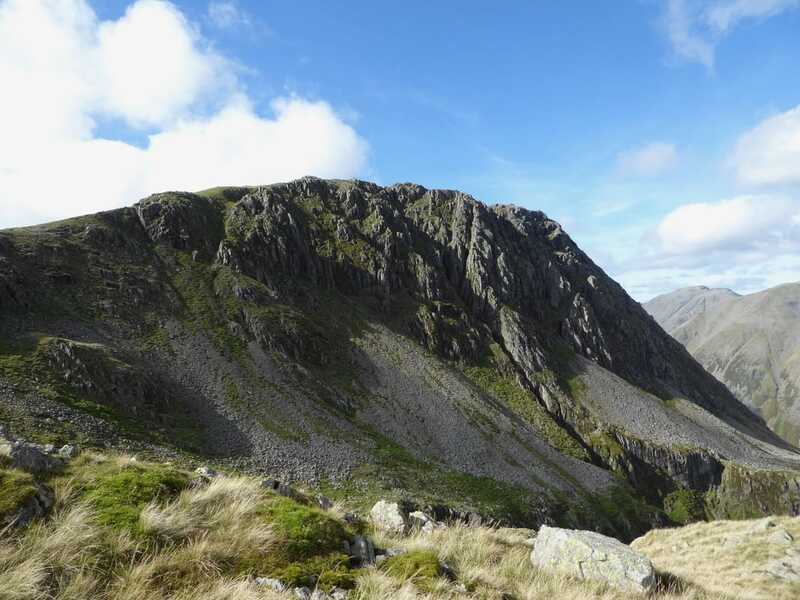 From the col it is another steep and stony ascent to gain the summit of Broad Crag. 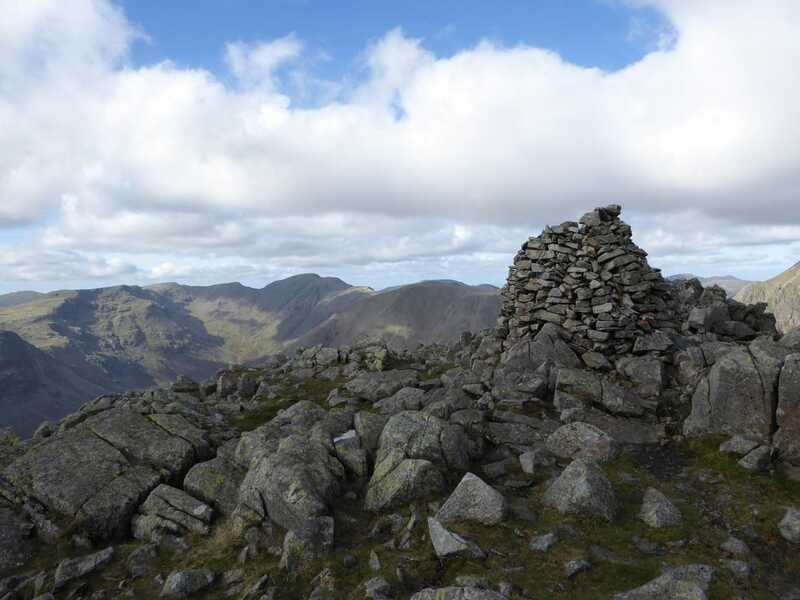 The top affords a great view back to Scafell Pike and onward to our next summit of Ill Crag that we reached via another descent & ascent on a good path. 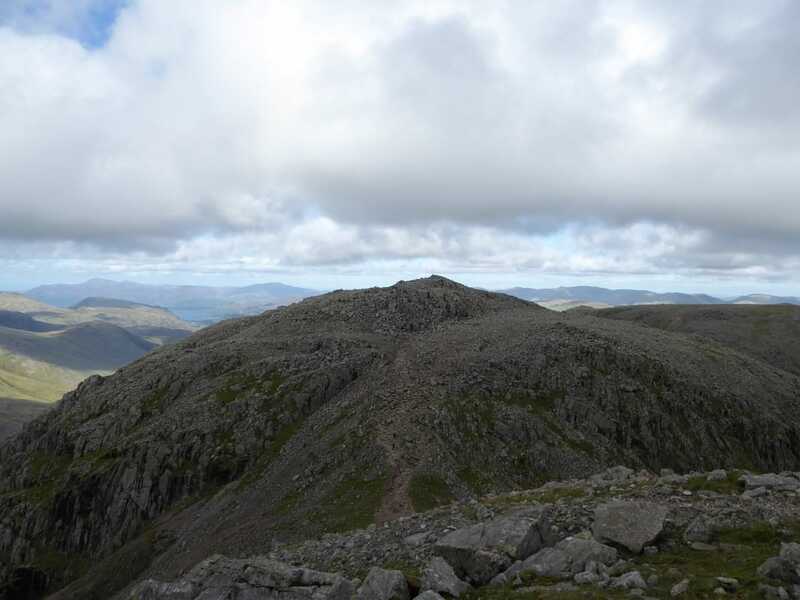 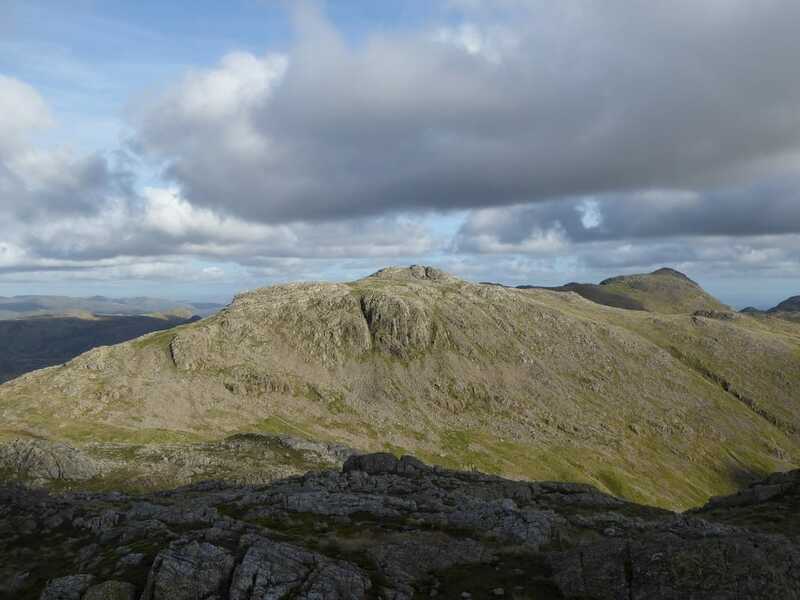 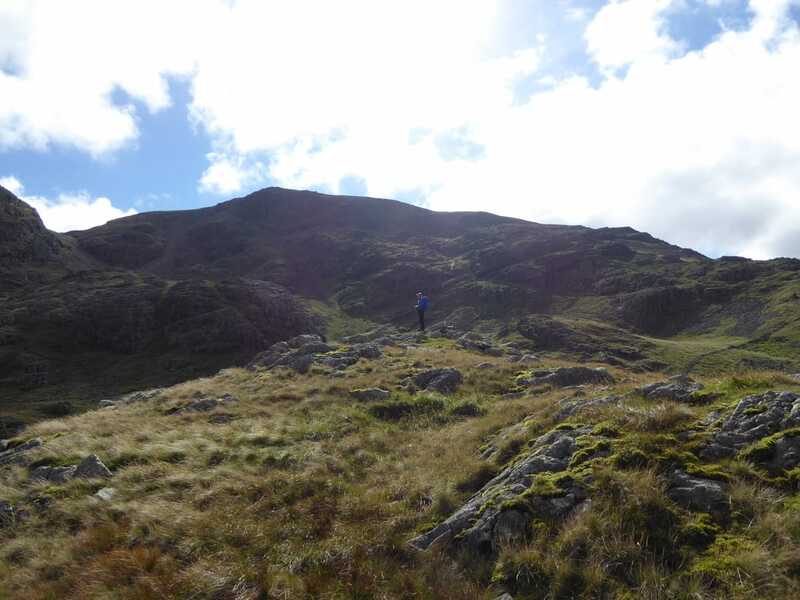 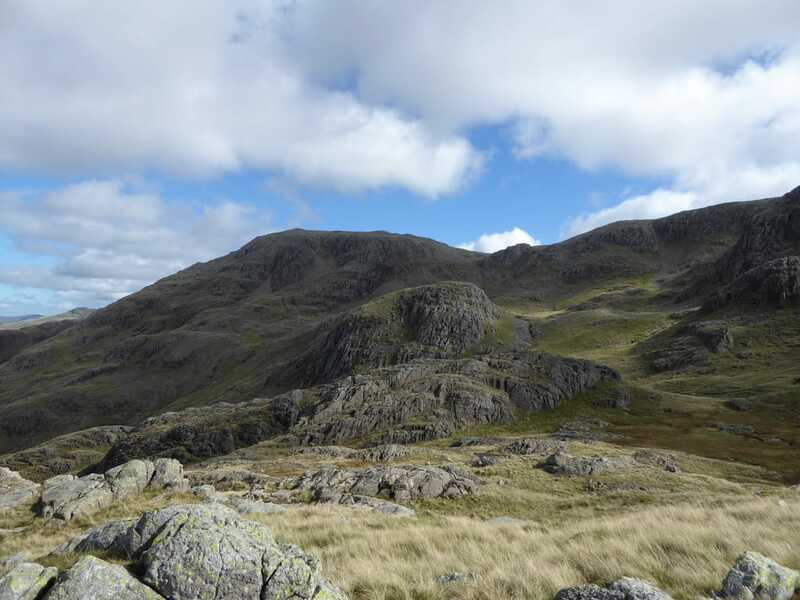 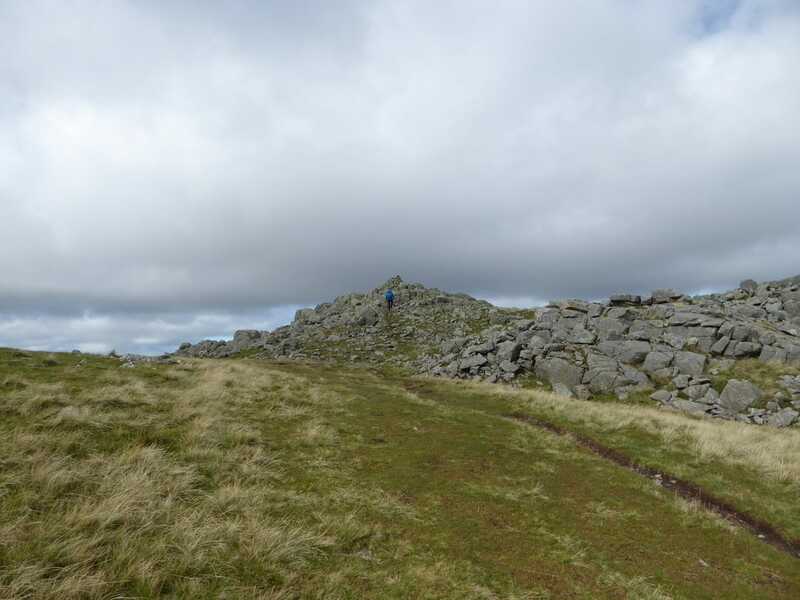 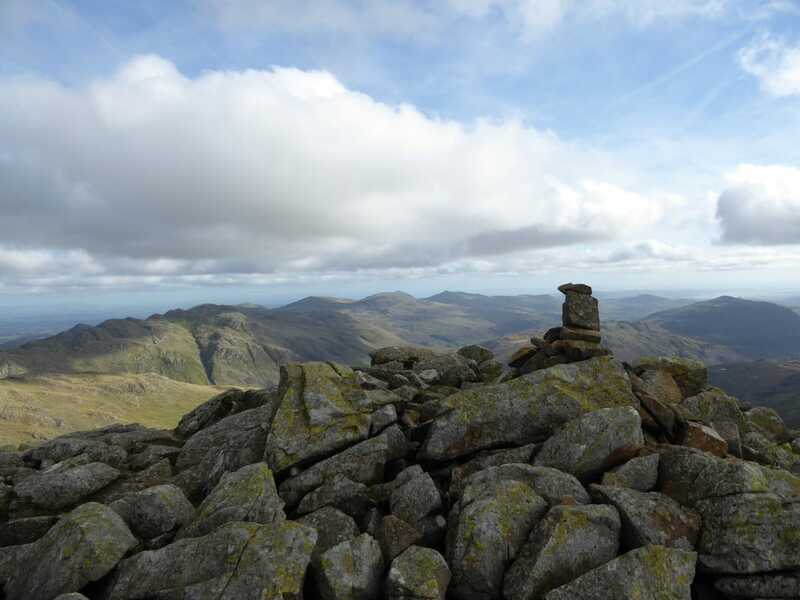 It is my guess that Ill Crag is not visited as much as it should be - it is off the main path back to Esk Hause and involves a bouldery clamber to gain its summit but it is worth it for the views to Crinkle Crags & the Coniston Fells - and it is a Furth also therefore worth the trip. 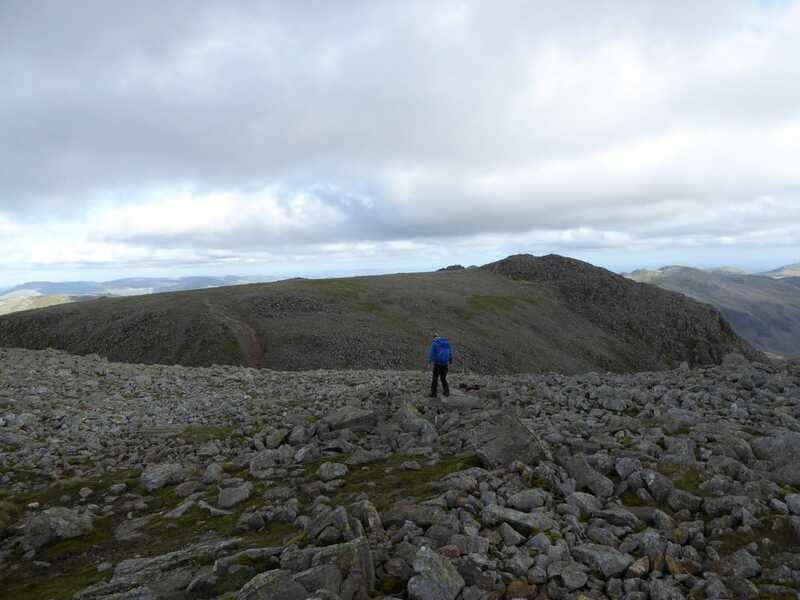 Leaving the summit of Ill Crag we headed back to the main path that now steepened gradually to reach the mountain pass of Esk Hause. 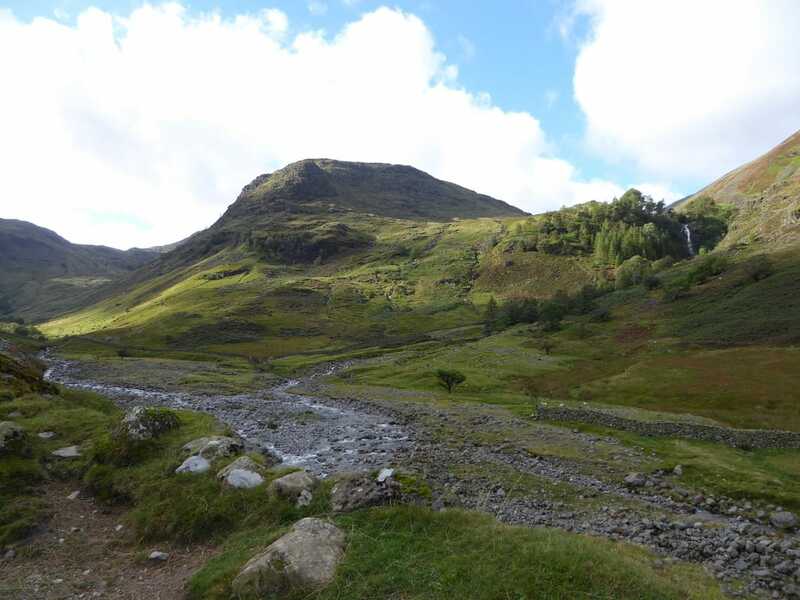 It was about 1700 now and we appeared to have the area to ourselves as we passed the path to Sprinkling Tarn to head northwards down the long and steep at times Ruddy Gill/Grains Gill route to Stockley Bridge from where we would retrace our steps back to the start at Seathwaite Farm. 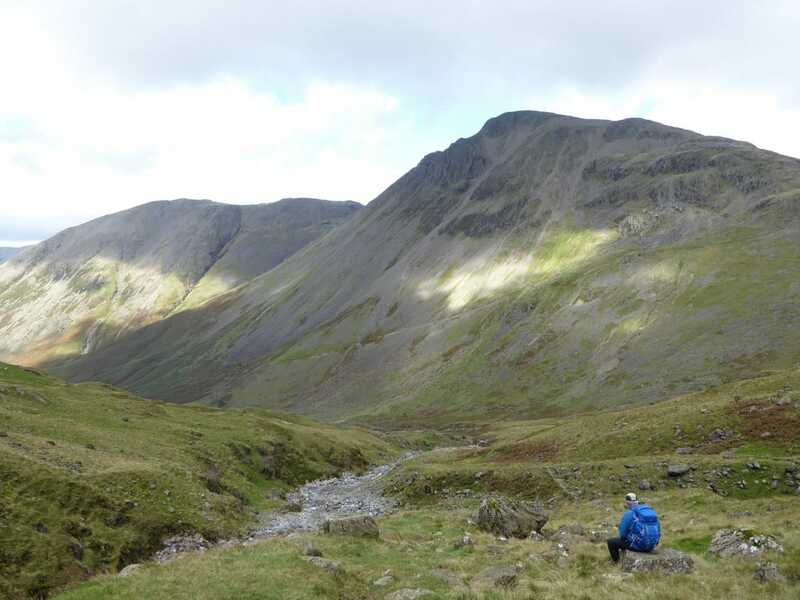 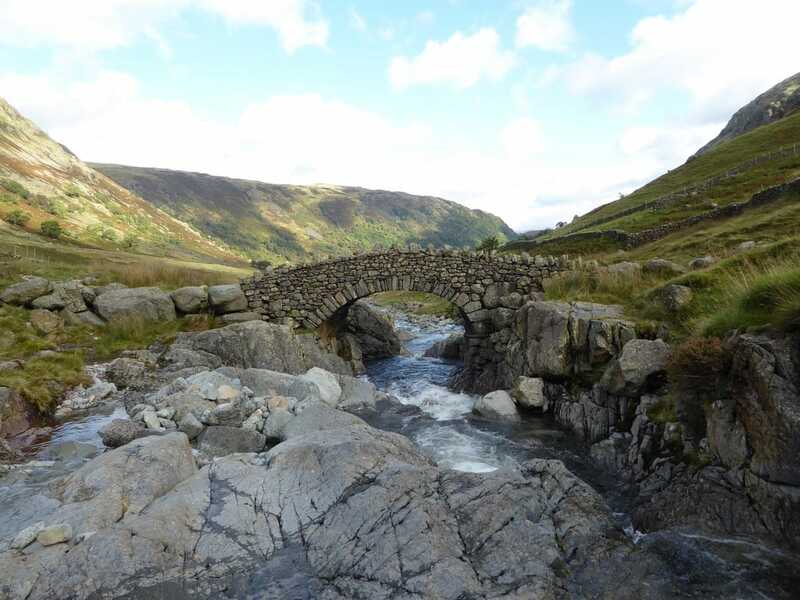 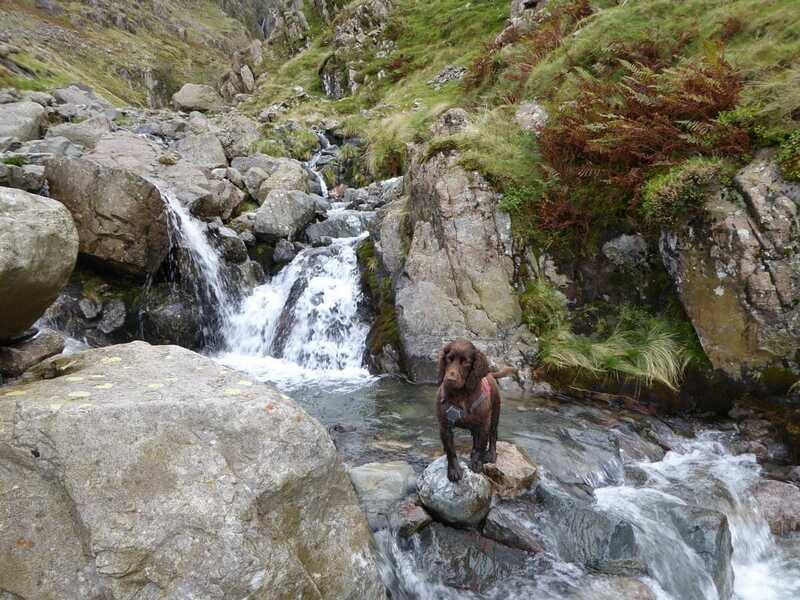 There are lots of ways up to the hotspot of Scafell Pike but getting there via Piers Gill is extremely enjoyable, full of interest and a fabulous walk. 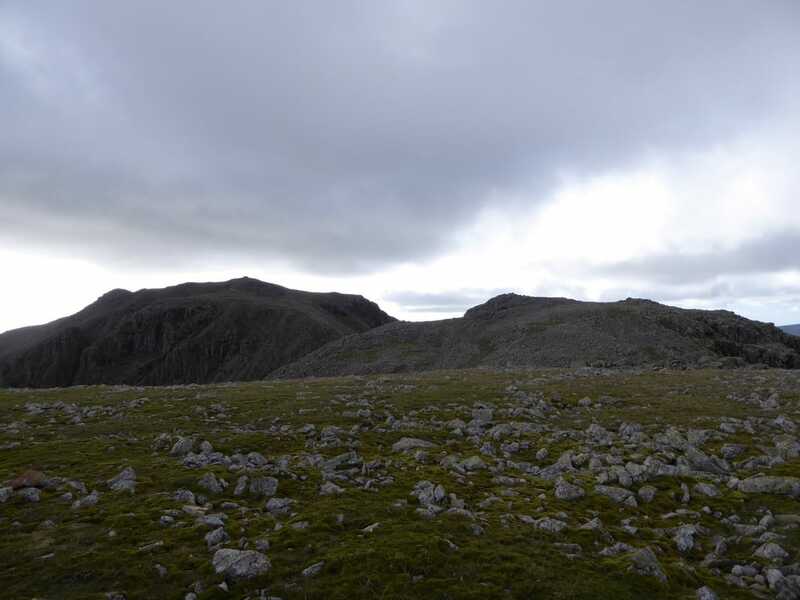 We saw few people until we reached Lingmell Col and no more after we left Scafell Pike. 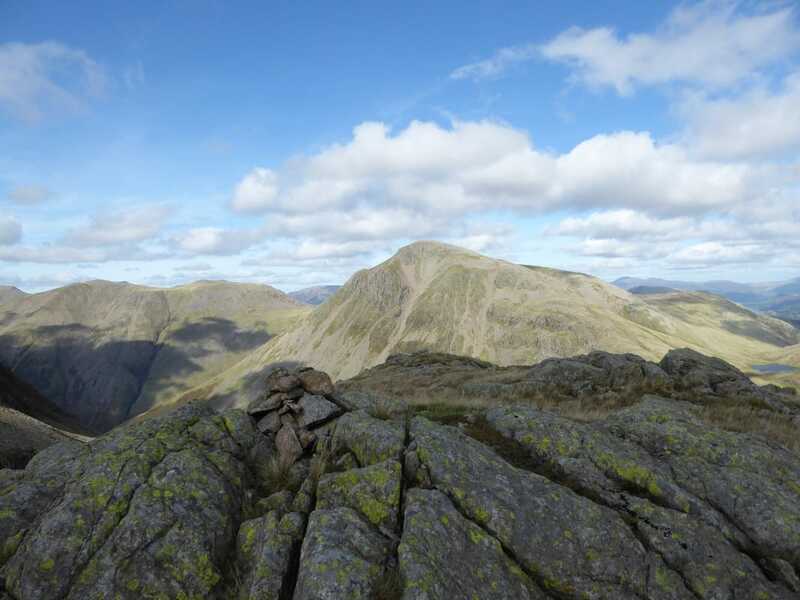 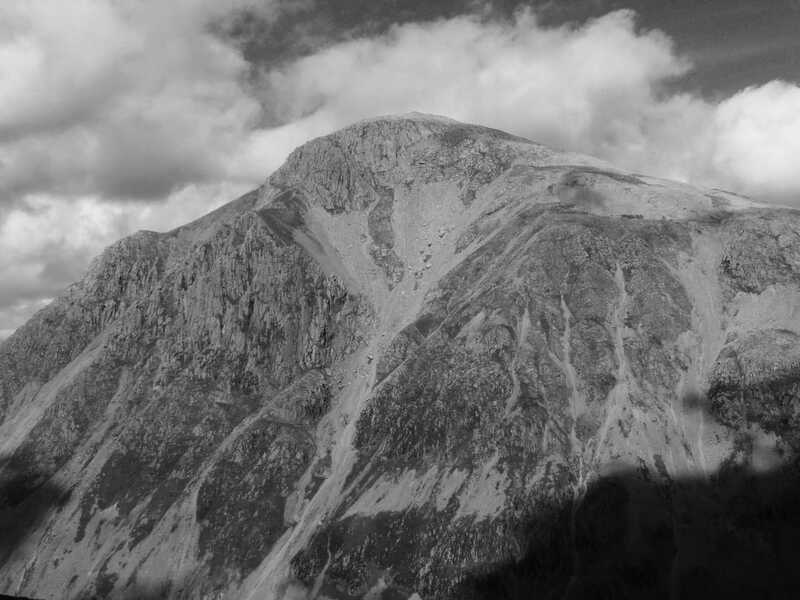 If you pick the right time & route then an ascent of the highest mountain in England can be an almost lonely one. 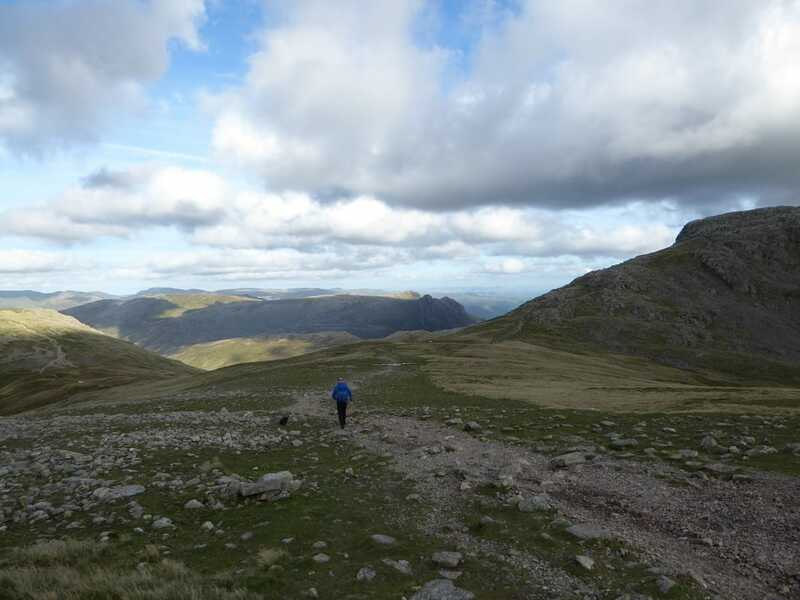 Heading back down to Lingmell Col with Scafell Pike ahead and Scafell to the right. 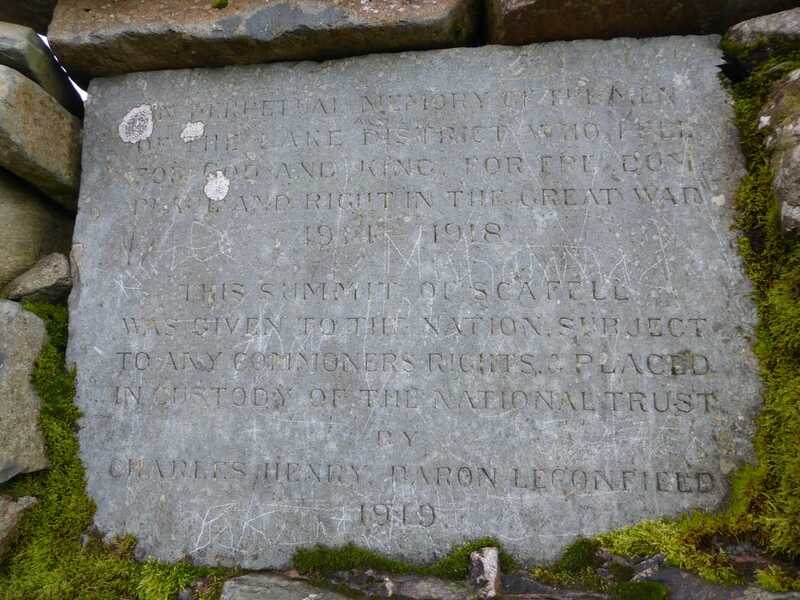 'In perpetual memory of the men of the Lake District who fell for God and King, for freedom, peace and right in the Great War 1914 - 1918.
by Charles Henry Baron Legonfield 1919'.